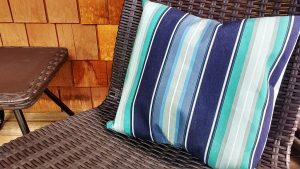 How to sew Sunbrella fabric outdoor pillows. After a record amount of snowfall this year and the ensuing snow melt and run off, my new home town of Mammoth Lakes, California is in full summer swing. We live at 8,000ft elevation. This means that while we’re high up amongst mountains and the trees, we’re also closer to the sun. UV exposure increases about 4% for every 1000 ft. (305 m) gain in elevation (source). So at my house, we are 32% more exposed to UV rays than at sea level. I mention this because I recently made some outdoor pillows for our patio furniture. 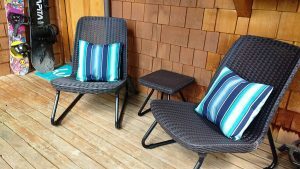 I immediately chose Sunbrella fabric as my go-to because of its incredible sun resistance and durability (among many, many other factors. Seriously, read up on Glen Raven’s Sunbrella fabric and see why it’s the number one choice in marine environments). I dug through my stash of Sunbrella which is currently three yards of fabric. I settled on Sunbrella Saxon Cascade, both because I liked the pop of turquoise and how it matched with my welcome door mat, and because the other two pieces’ stripes were too big for the 18″ x 18″ pillow forms I planned to use. 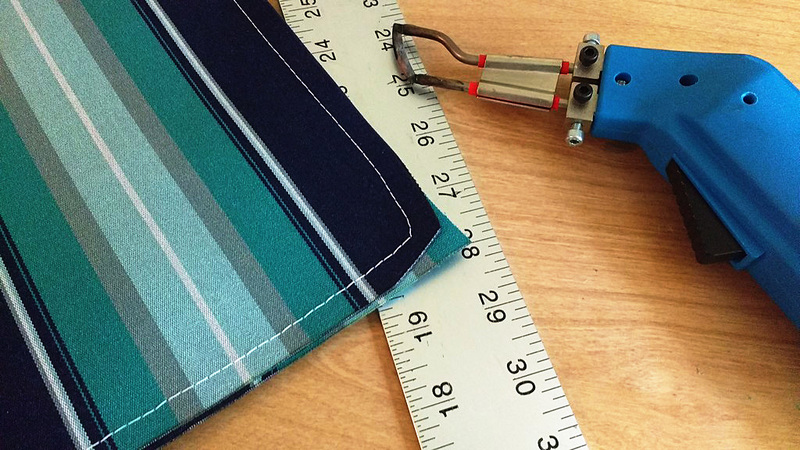 Sunbrella is an acrylic fabric & hot knives cut through it like butter. 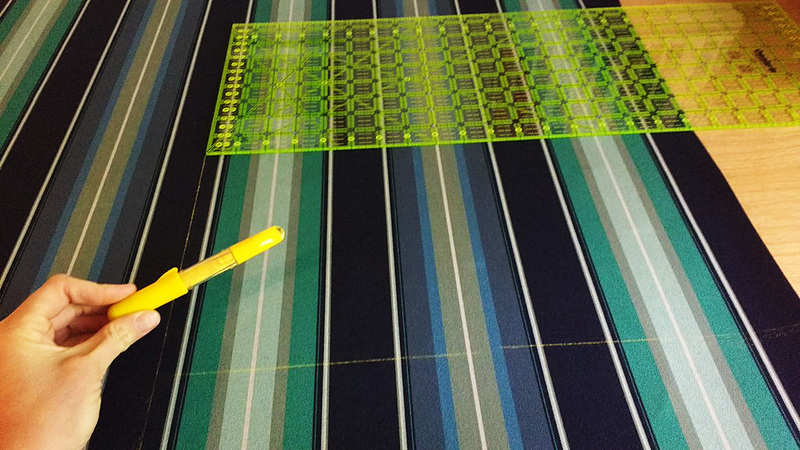 Sunbrella is an acrylic fabric and hot knives cut through it like butter. I love to use hot knives when I cut out my pieces because the knife seals the edges to prevent unraveling. I love to use hot knives when I cut out my pieces because the knife seals the edges to prevent unraveling. 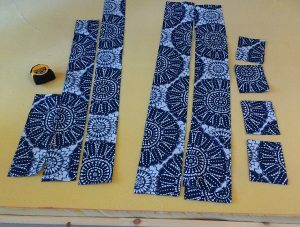 I planned to do envelope closes for these pillows so I marked out my two front pieces and four back panel pieces. 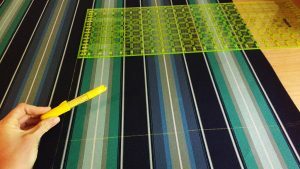 For navy or black-colored fabric I use my Clover Chaco Liner pen in Yellow which is available from SewingMachinesPlus.com. 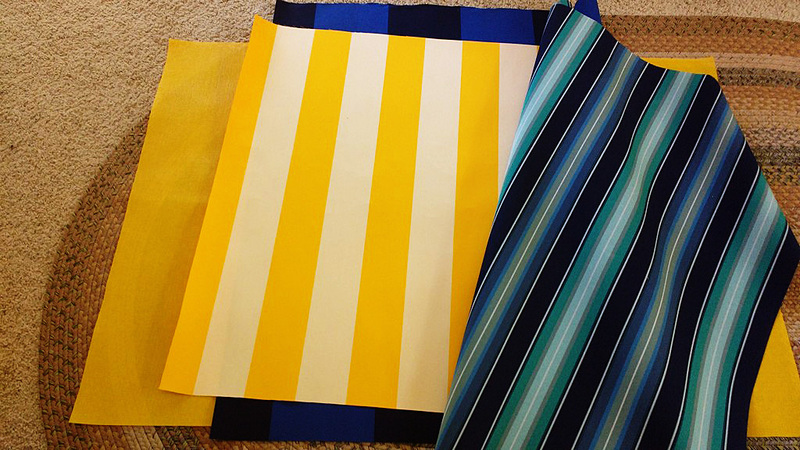 For navy or black-colored fabric I use my Clover Chaco Liner pen in Yellow. It’s super important that you put metal or ceramic, or something safe under the marked lines you’ll be using the hot knife on. I flip my 48” Starrett ruler over and cut on that. It’s super important that you put something safe under the marked lines you’ll be using the hot knife on. Next, I like to slightly round the corners of the pillow fronts (I’ll do it to the back pieces too once everything is sewn together.) 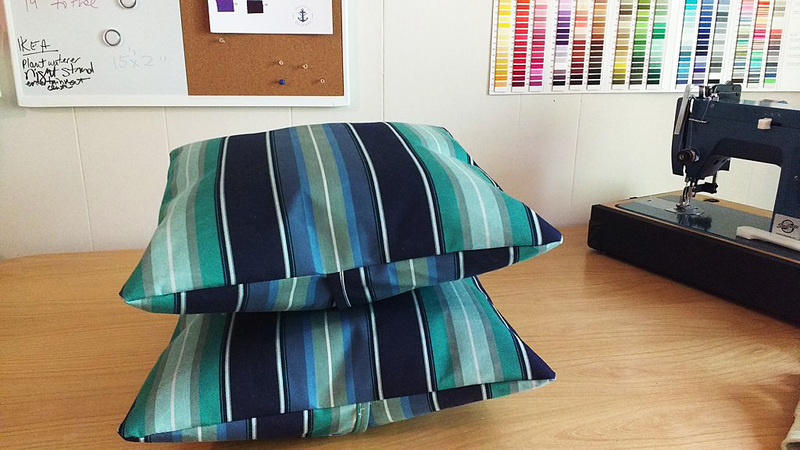 I went over this method in my post here on how to sew square pillows with piping. I like to slightly round the corners of the pillow fronts. 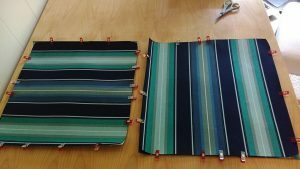 Now it’s time to finish the seams on your back panels. 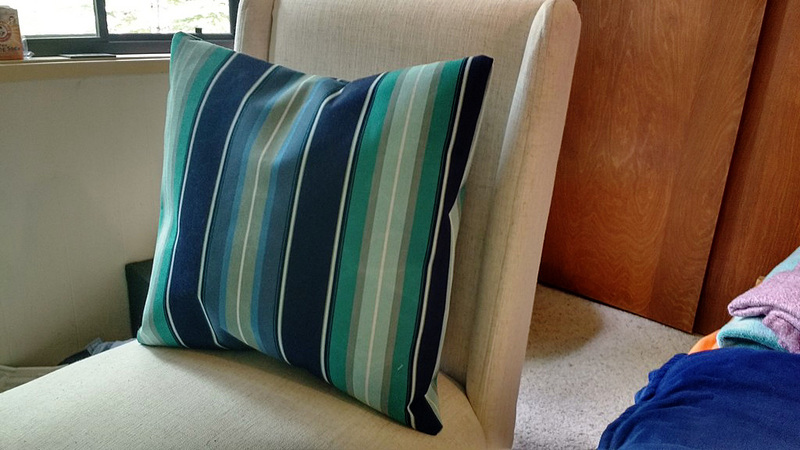 Sunbrella is great for finger folding over, plus working with stripes often makes marking your seams easy. 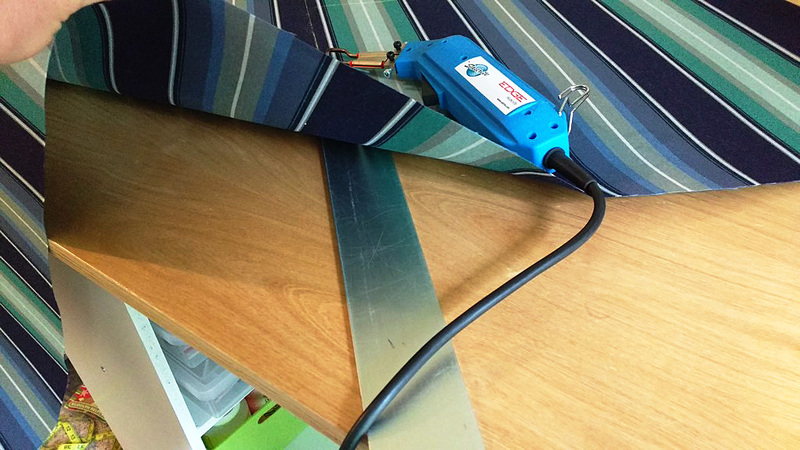 Tip: when you use a hot knife it can make the finished edges of Sunbrella fabric a little sharp. Be careful when finger folding that you don’t hurt your fingers! 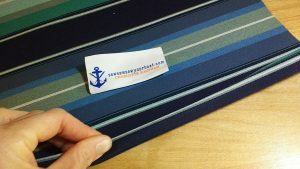 Now is the time to sew in a tag if you have one. Putting a regular sewing pin through Sunbrella is almost impossible. I use Wonder Clips on projects this small to hold my pieces together. SewingMachinesPlus.com has them available here. I use Wonder Clips on projects this small to hold my pieces together. Once sewn, I use the hot knife to round the corners of the back panels to match the top panels. I use the hot knife to round the corners of the back panels to match the top panels. Now it’s time to turn. This will be crinkly! 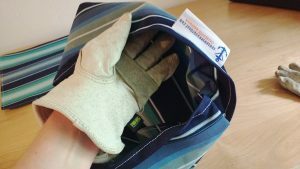 Tip: use leather gloves or gardening gloves while turning your fabric to avoid getting your skin cut or scratched from the hot-knifed edges of fabric. Use leather gloves or gardening gloves while turning your fabric. Slip in your pillow forms and enjoy! 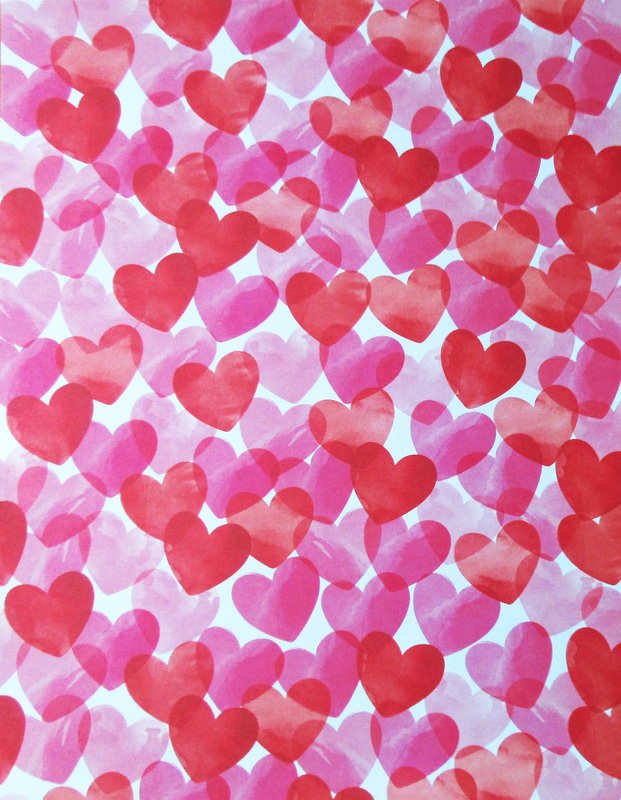 How gorgeous is that fabric? Truly! Do you make your own outdoor furniture accessories? Tell us about it in comments! 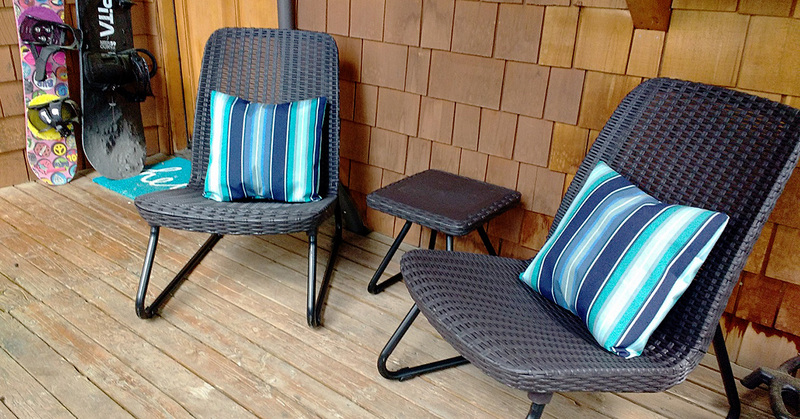 Do you make your own outdoor furniture accessories? My fast and easy way to hem jeans & pants. I’m barely over 5’ tall. It used to be that clothing companies made pants in “short” lengths to accommodate people of my stature. More and more often now, though, I’m finding that clothing companies, particularly jeans producers, make pants in “regular” and “tall.” I’m not sure why they think all the short (or as I prefer to call it, concentrated awesome) people no longer need pants, but there you have it. As you can imagine, this leaves me with the choice of either patching jeans and pants until there’s nothing left to them, or buying clothes that are too long and hemming them. Hemming something I’ve paid money for ticks me off, so I want to get it done and over with quickly. I developed a fast and easy way to hem jeans and pants. Find a pair of pants that are a length you like. These will act as your template or guide. Lay them flat and smooth. If possible, I suggest pinning them down to keep them flat. Next, turn the pair of pants you’re going to hem inside out. 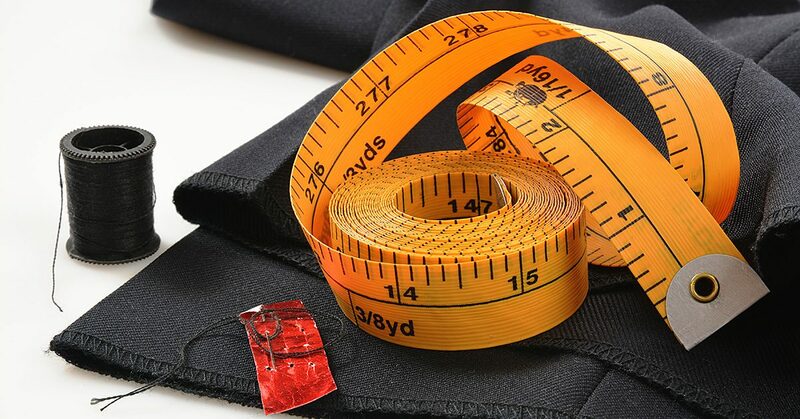 Lay them on top of the pants that are the correct length. Choose a place on the leg of the pants where you’ll be okay with seeing a line. I often opt for the upper thigh. In that spot, pull the leg of the pants that are too long up, gathering the extra fabric in a straight fold that goes around the entire leg as you go. When the pants are the right length, pin this fold so that it comes directly out from the leg itself. Do this on both legs. 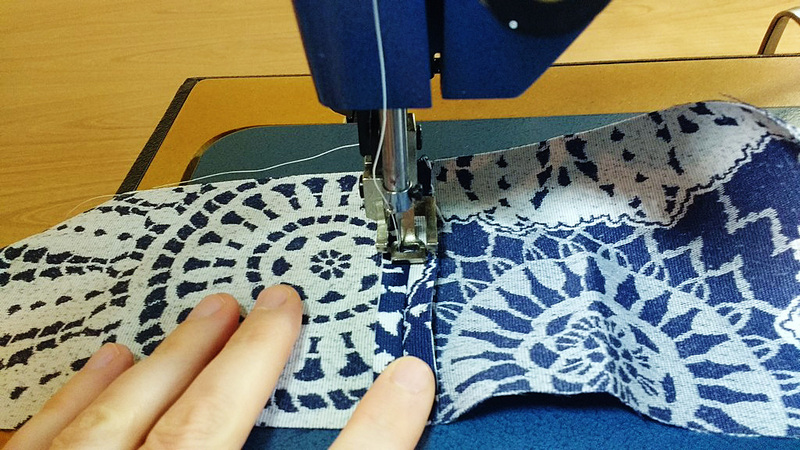 Sew around the fold to create your shortened pants, then cut off the extra fabric. Whip stitch around the cut edge for extra strength in the seam and reassurance that it won’t split apart while you’re wearing your new pants. Again, do the same thing on both legs. 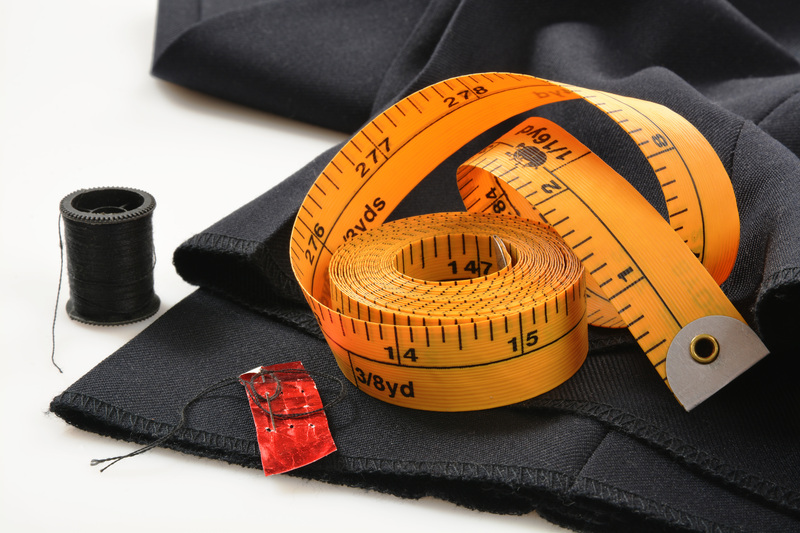 Hemmed pants, perfect for your height – no measuring or marking required. 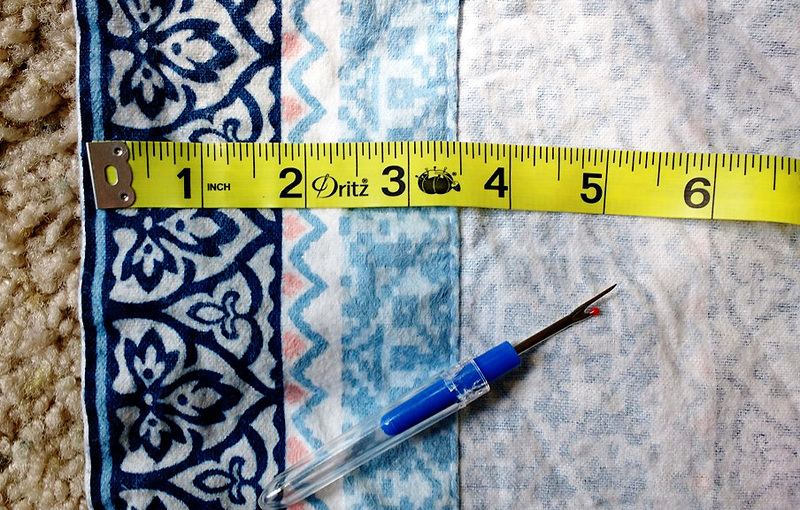 This is one of my favorite “sewing cheats” because it’s so quick and helps me buy pants and jeans affordably, even clothing companies no longer feel the need to cater to people my size. Give it a try next time you need to hem pants and let me know what you think! Not so long ago, I had a series of plaques that I’d earned hanging on my wall above my bookshelf. Since then, the bookshelf was moved for the sake of rearranging my bedroom, and those same plaques were then hanging to the right side of my bed with a big space of emptiness below them. Now, because I had a concern about those plaques falling off the wall and onto the bed during the calm of a night’s sleep, I took them off of the wall altogether. And now? Now, I have an even bigger empty space—one that exists from the ceiling to my bed. That’s boring. Very, very boring. It’s like my bedroom is incomplete, and I will potentially feel frustration over this until it’s covered and decorated as fully as the rest of the area is. 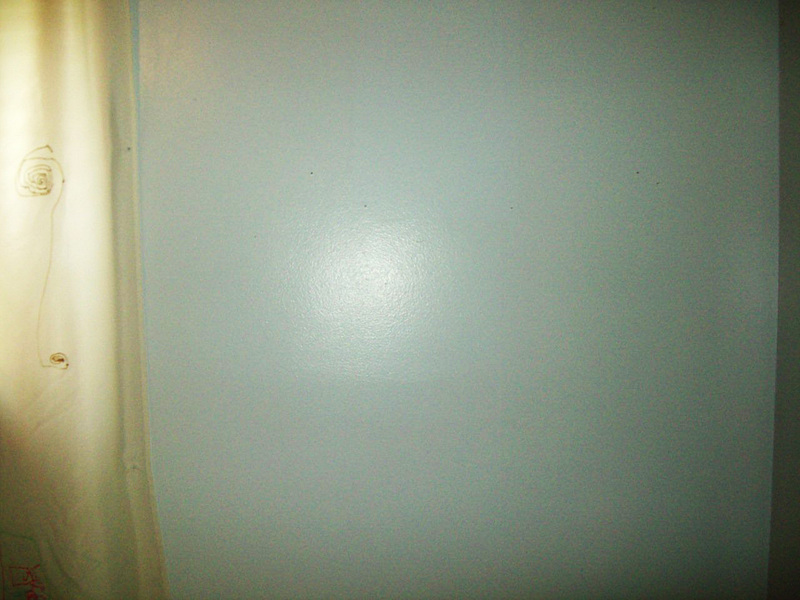 So because I have such a distaste for the blankness of the wall, my mind has been perusing the possibilities as to what specifically could go on this space to fix the issue and therefore give me a more relaxed mentality in regard to this wall that’s so close to the right side of my bed. 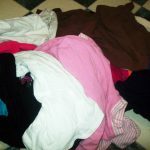 You see, I recently cleared out some clothes from the dresser, and if you’ve learned one thing about me through reading my posts on this blog, it could be that I’m cheap and like to make use of what I already have for fabric. So since I did that dresser-clearing, I have material right in my bedroom that can be used to create something to go on this too-empty wall to my right. But what would that something be? That became the question, and through internet browsing, I’ve come up with two options I’d like to share with you. 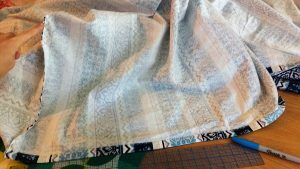 The first of these possibilities is to create a wall quilt to hang there, one that’s a combination of the pieces of fabric that were banished from the dresser. 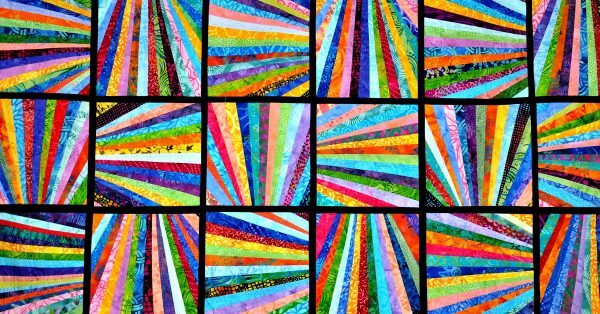 Since I adore patchwork quilts, this option could be accomplished by the simple process of using similarly sized pieces of fabric for each block to compose something that’s bright and vivid—and an interesting touch to my wall décor. 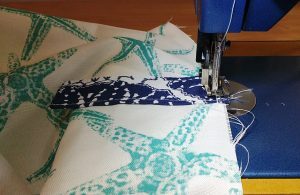 As I’ve covered patchwork quilts a number of times already on the blog, I won’t go into too much detail about how to make one. Just know that it’s a prospect, and time and effort could lead to a one-of-kind wall hanging to fix my problem through this method. Beyond that though, I noticed a particular quilt idea that sparked an idea that moves away from the actual quilt theme. It was from a quilt that depicted a flower garden, and it occurred to me that the overall scene could be applied away from the quilt setting. How? 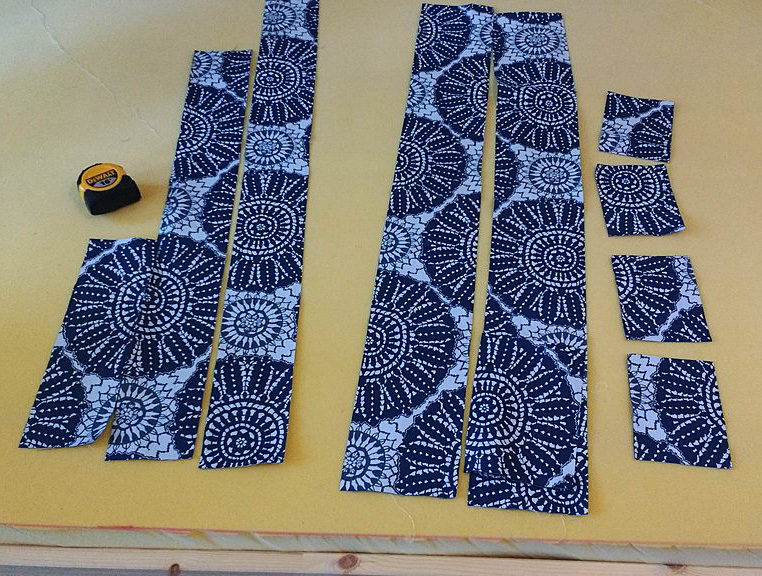 You’d just need to assemble the pieces of the quilt project in separate formations and hang them on your wall instead of sewing them to the quilt. For instance, you could take a marker (use a fabric-friendly writing utensil!) and trace the patterns of flowers, butterflies, clouds, the sun, a house… Whatever you feel is appropriate for the scene you’re trying to showcase. 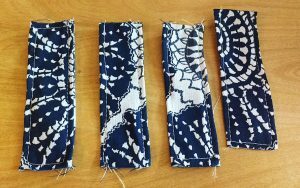 Simple rectangles could be used to create a fence, or a combination of fabric types could come together to create something as intricate as a rosebush. 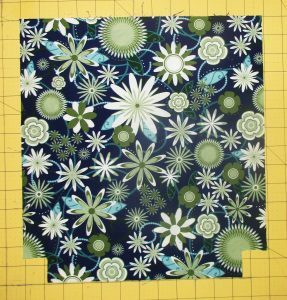 Just imagine a hole fabric-created garden scene placed right on your wall! 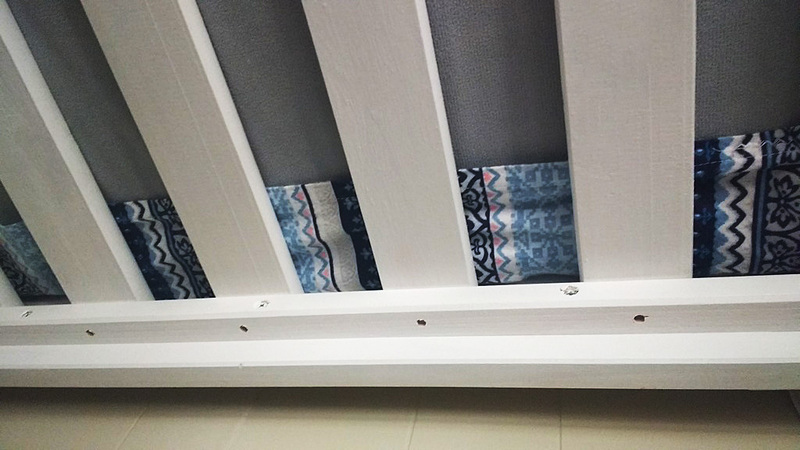 In fact, this idea could be embraced for more than just using your fabric to cover up an empty space on your wall. 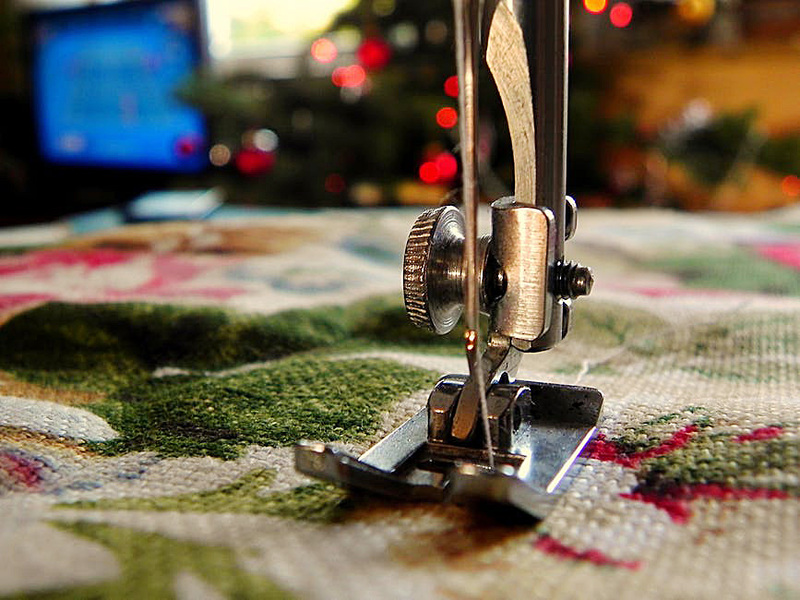 You could use your old fabric to create holiday scenes, for example, for a sentimental touch to your decorations. If you only have red and white, you could make candy canes. Only blue? How about snowflakes?! A series of fabrics? Get to work on a gingerbread house! These individual pieces could be tiny projects that of themselves are beautiful and worth showing off, but when you bring them together, their appeal increases—a lot! Don’t overlook the prospect of constructing these tiny projects that come together for a bigger work of art! It’s like a quilt, but without the actual quilt part—which is a pretty interesting twist to me! 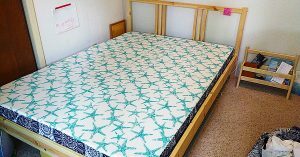 My husband and I sleep on a full-sized bed on 4” of high density foam that we bought from Keyston Brothers, a store that specializes in auto and marine foam and fabric (We use density type Q41 for anyone interested in doing the same). 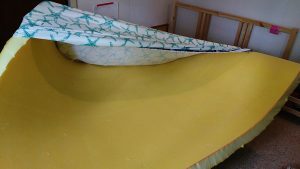 We find the foam lasts about five years before we need to replace it and for a full-sized mattress’ worth, it costs about $250. That is loads cheaper than a fancy mattress and we sleep like babies. We discovered this foam when we were replacing the cushions in the v-berth of our sailboat. We lived aboard for almost eight years and slept amazingly. When we moved on land we decided to cut costs and stick with the foam. I made a custom cover for it but this frame we recently got from Ikea is smaller than the foam. See how it curves down into the bed and up and over the edges? My husband and I were getting rolled into each other at night so I knew I was going to have to take matters into my own hands. See how it curves down into the bed and up and over the edges? I took off the cover I had made and measured the foam to a size that would fit in the frame. Then I got out my $20 electric cutting knife from Walmart and got to slicing. Take a deep breath. We’re about to slice into our bed. Ready? Let’s go! Upstairs, I cut the side piece (zipper piece) off of the top and bottom of the cover. Here are the two main panels laid out. Here are the two main panels laid out. I had finished all my seams with zigzag stitches and there was no way I wanted to take out all those stitches. Instead I saved the zipper by just taking out the straight stitches holding it to the cover. I saved the zipper by just taking out the straight stitches holding it to the cover. Zipper saved! Now I didn’t have to buy another one for the smaller sized cover. Math time! Here I had to work out the new size of the zipper plaque and the rest of the side facing. 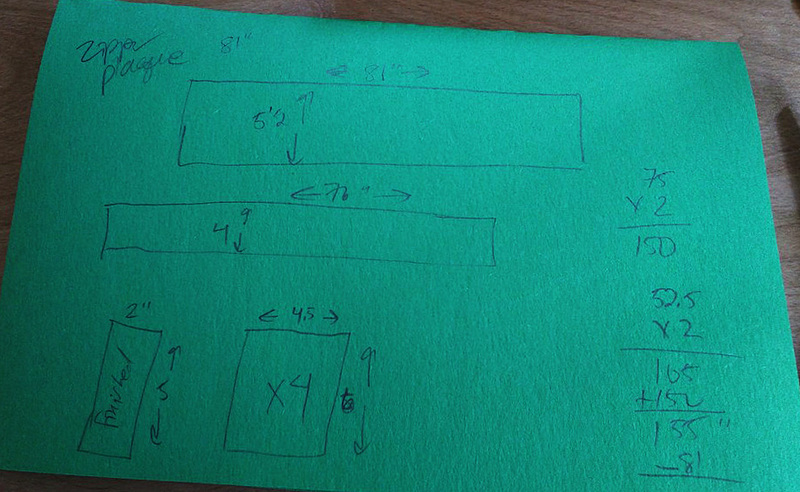 Plus I wanted to add handles this time so I measured out those too. 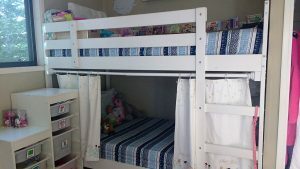 I also cut the top and back panels to the same size as the foam that now fit in the bed frame. 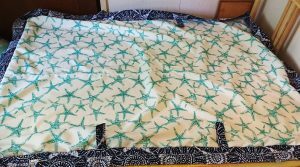 I was all out of the original fabric I had used to make the mattress cover so I used some leftover Sunbrella scraps I had from another project. Here are the parts I’ll need to piece together for the zipper plaque, the rest of the sides and the handles. Here are the parts I’ll need to piece together for the zipper plaque, the rest of the sides, & the handles. 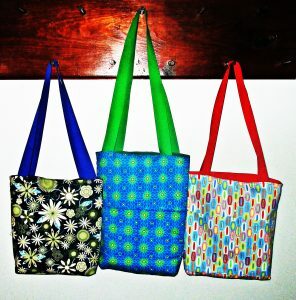 I made quick work of the four handles and top stitched them for strength. The ends are unfinished as they’ll be sewn inside the cover. 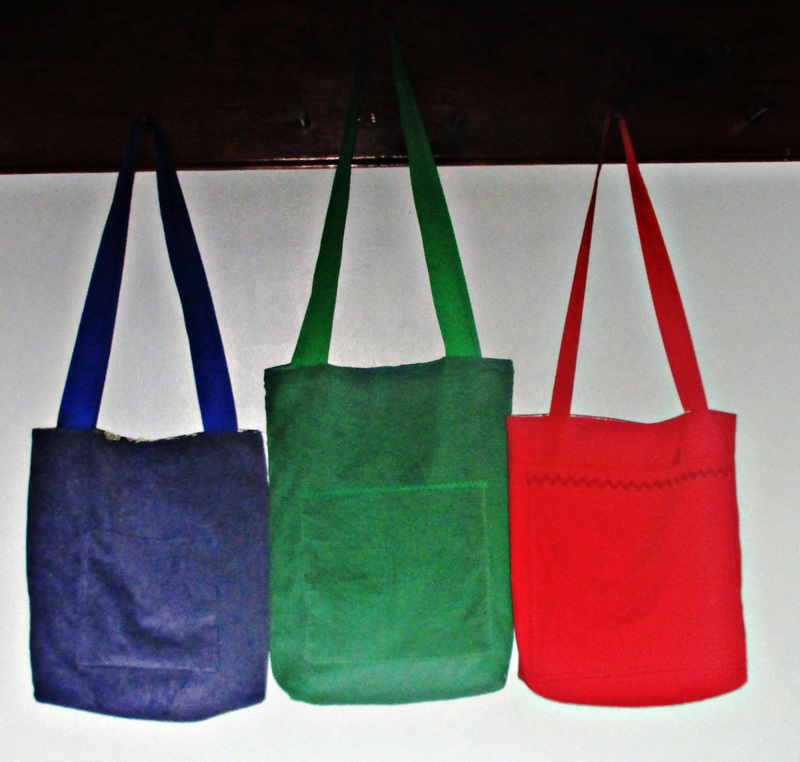 I made quick work of the four handles & top stitched them for strength. Next I sewed the zipper plaque and side pieces together. I also made sure to zig zag stitch each join to prevent the fabric unraveling. Next I sewed the zipper plaque & side pieces together. Making the zipper plaque is my favorite part. It means I’m getting close to being done. Here I’ve switched to a zipper foot so I can get super close to the zipper. Making the zipper plaque is my favorite part. Next I sewed on the handles to one of the large panels. Now it was time to add on the side facing. Yes! I joined one end of the side panel to the zipper plaque and started sewing on the zipper plaque portion first. Then I just transitioned to the side piece and kept going all the way around. Now it was time to add on the side facing. I stopped several inches before I got back around to the beginning and joined the two ends. 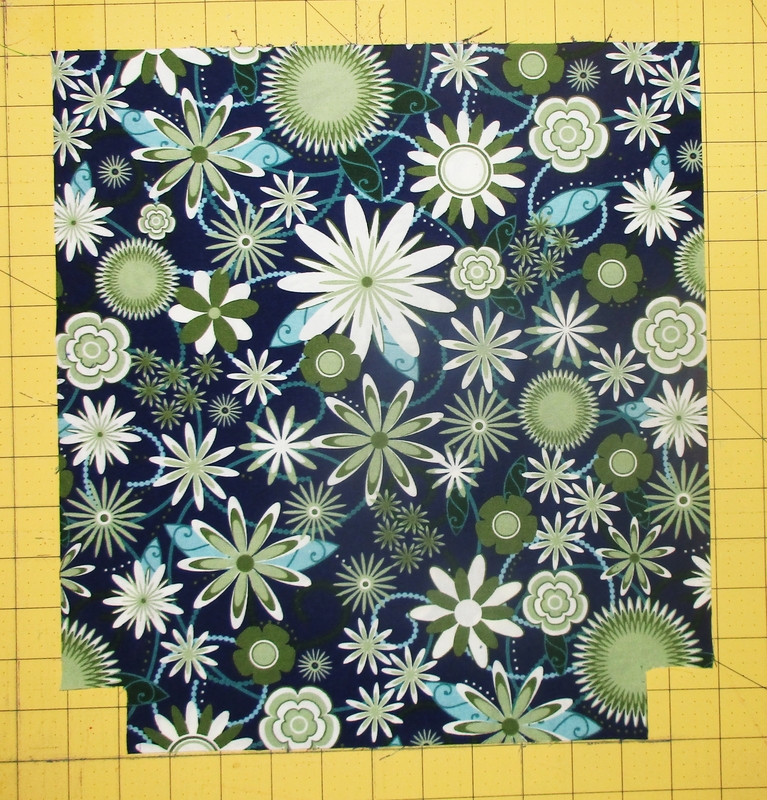 Then I trimmed off the excess, zig zag stitched the join, and then sewed that piece onto the bottom panel completely. I stopped several inches before I got back around to the beginning & joined the two ends. Pro tip: make sure you open up your zipper enough right now that you can get your hand through it to open it completely when turn this right sides out in a few more steps. You are so close now!!! 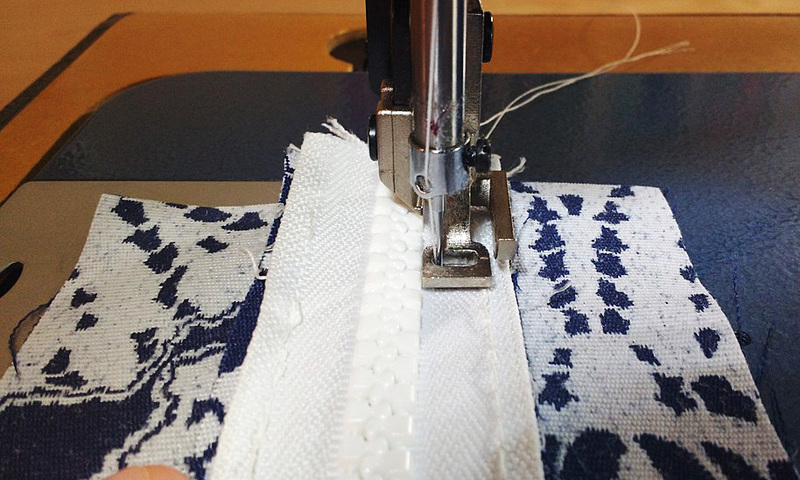 Before you begin sewing on the top panel there are still two important things you need to do. Create match up marks. 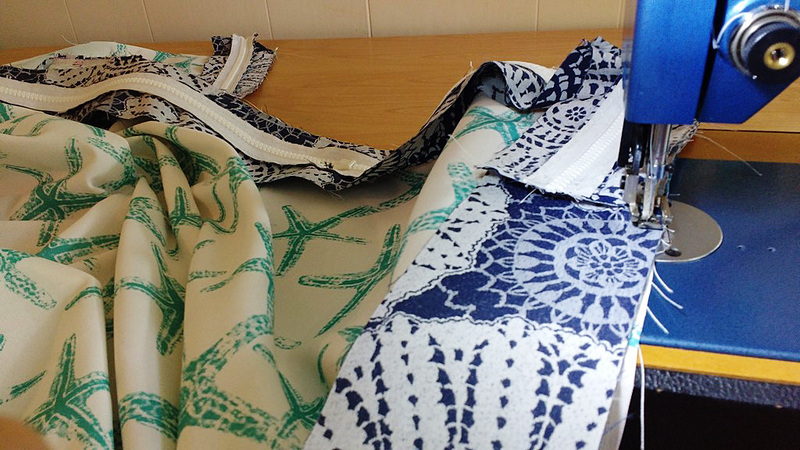 When you are working with large pieces of fabric, things have a tendency to shift. These marks will let you know you are joining the two pieces together where you should. 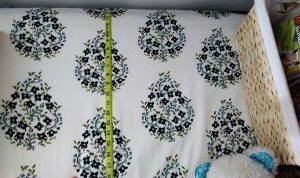 If you look carefully you will see pink marks on either side of the fabric at the 19” mark. I marked the side pieces and then the top piece so everything should match up when I sew. 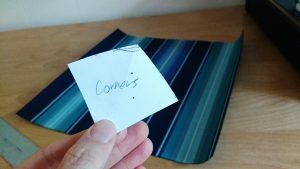 Do your corners!!! This is crucial. Go to each corner and fold it down and back until you are sure the piece is square with each side. Then mark that spot so you know you’re at the actual corner when you get there. 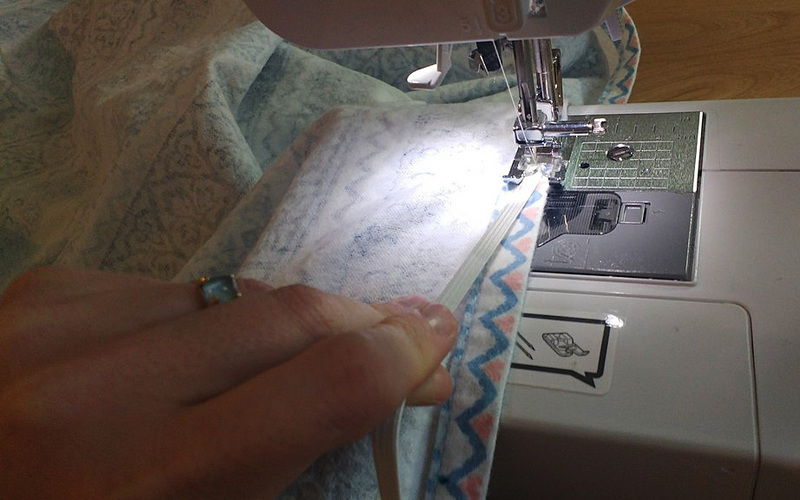 Begin sewing your final panel to the cover. I like to put the panel that is being sewn on the bottom. Here you can see I’ve matched my corners perfectly. Here you can see I’ve matched my corners perfectly. When you’ve sewn all the way around you are ALMOST done but not quite. There are two things to be done first. 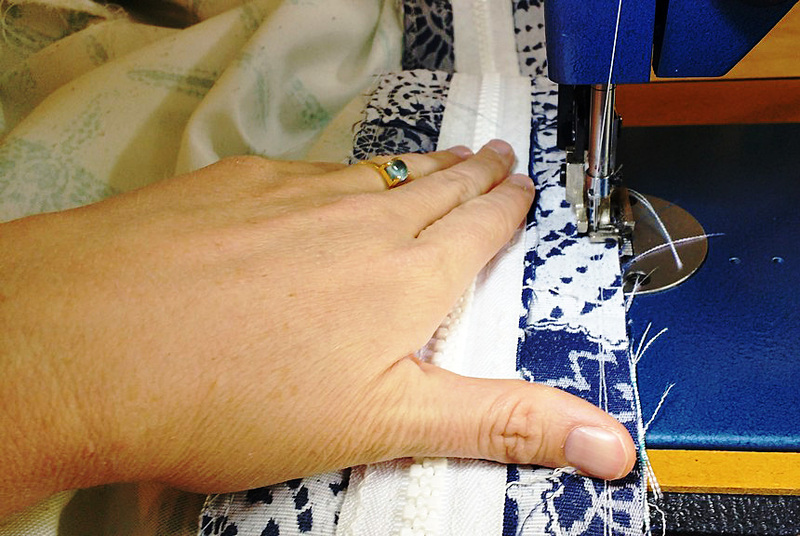 Take the time to carefully inspect ALL seams, fronts and backs. Sew anything you might need to. Then you need to zigzag stitch both seams in order prevent the fabric from unraveling. You may think you have finished the hardest part, but the worst is yet to come. You may think you have finished the hardest part, but the worst is yet to come. It’s time for cushion Olympics. Yes, wrangling foam into cushions should be an Olympic sport. Go slowly. Do not pull the fabric or you will rip your seams and pop your zippers. Rather, walk the foam into the cover. I like to fold it on the ends and walk it a little sideways. Patience, patience, patience. Fit your foam into the pattern just the way you designed it. It you did your math right, it WILL fit. 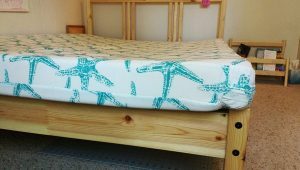 After burning some calories (always a good thing), you will have your new mattress with custom fitting mattress cover that actually fits into your bed frame. Now you may rejoice. Look at those clean lines! 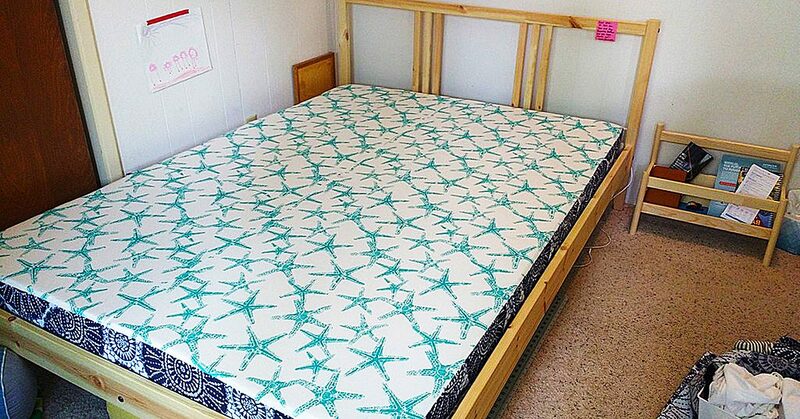 Do you make your own bedding, including mattresses? We’d love to hear about your work. 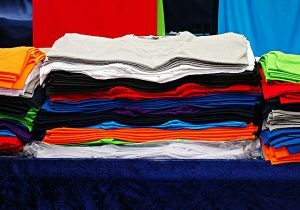 If you’re anything like me, when you find a t-shirt that fits well and is comfortable, you buy a bunch of them in a bunch of colors. Next time you do this, buy at least one more in a duplicate color. That t-shirt becomes the base for creating a fancy t-shirt that shows of your personal style. Build off it using items like lace, patches, fabric scraps, piping and beads. Or try your hand at embroidery. There are a couple of ways to use lace on a t-shirt. 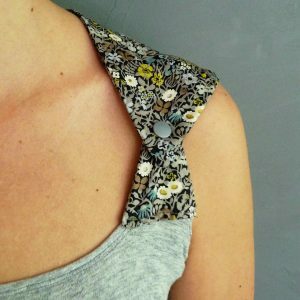 You can use full pieces of it to create a collar or edging on the sleeves or bottom. 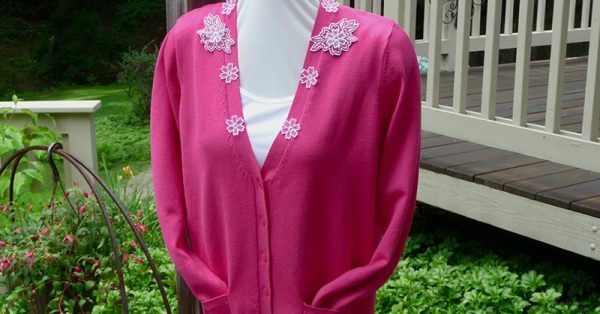 If that’s a little too vintage for you, try cutting apart lace and sewing parts of the design on the shoulder, sleeves, hem or around the neckline. 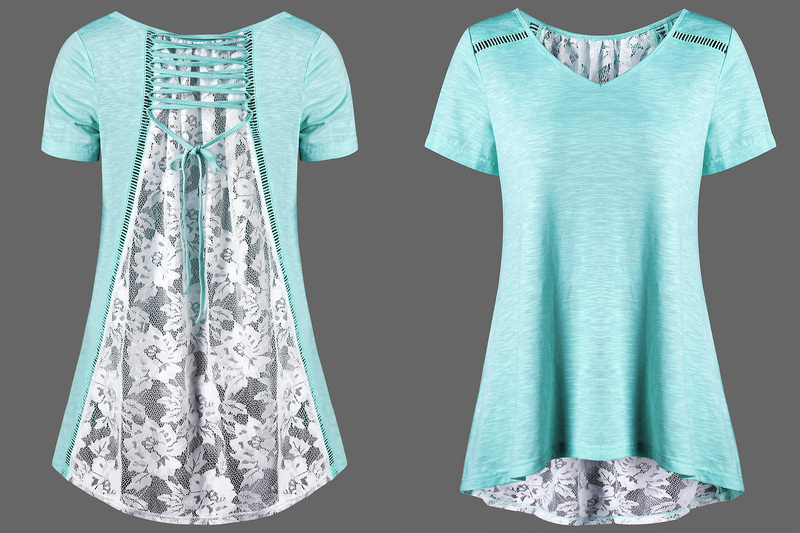 There are a couple of ways to use lace on a t-shirt. I’m a big fan of patches. 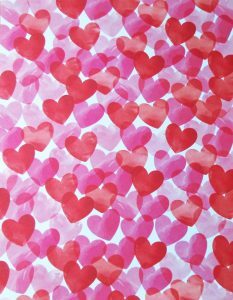 Browse through your local craft store and find some that you really like. 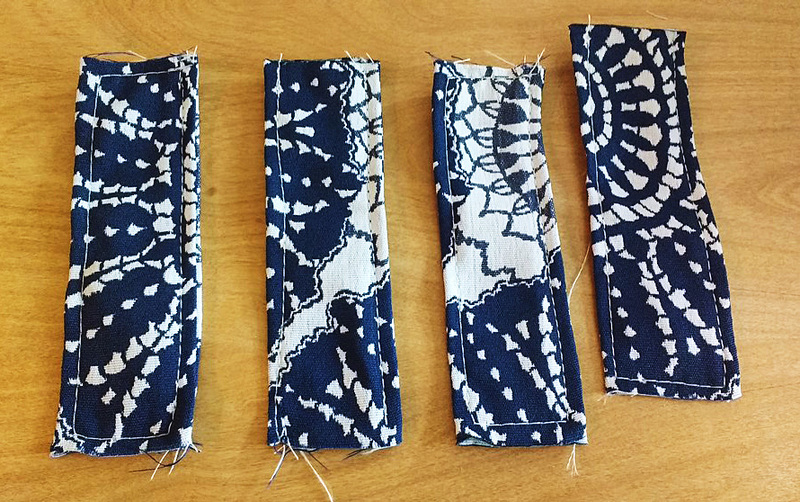 Place them on the sleeves, shoulders or bodice of your t-shirt to create the look you want. 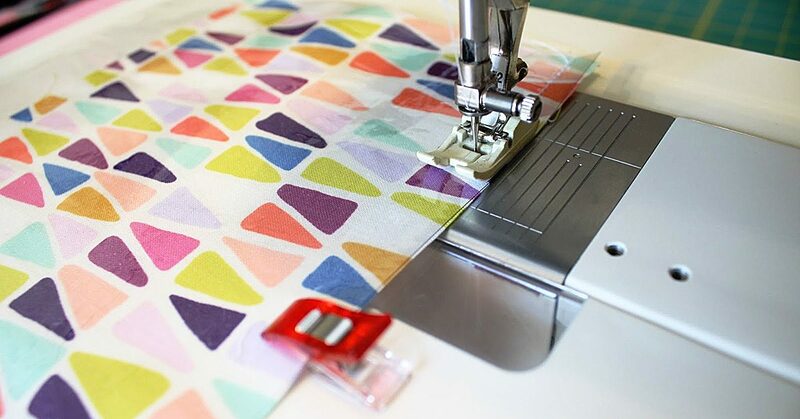 Even if they’re iron patches, I advise you to sew them on using either your machine or hand stitching. I’m a big fan of patches. Use these in a similar fashion as store bought patches. 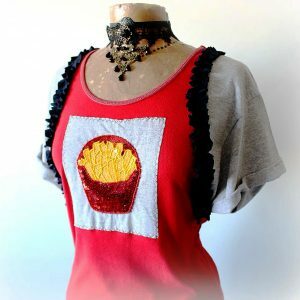 It’s a great way to use up some of your fabric stash while creating a funky, country t-shirt look. I recommend sewing the edges under to prevent fraying, unless you’re going for that look. 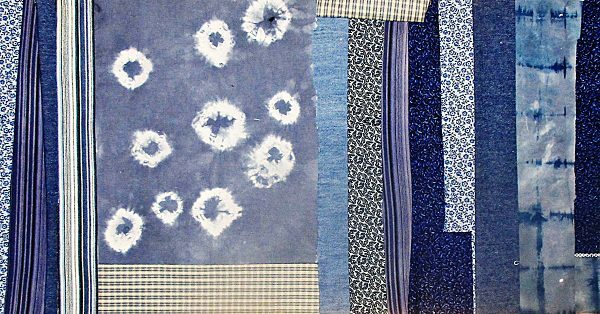 Using a fabric marker in combination with fabric scraps can add to the country-chic look. Use these in a similar fashion as store bought patches. 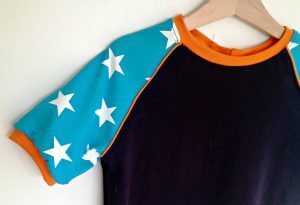 I love using piping around the bottom of the shirt and sleeves, but there are other options too. You can create a military look using piping on the shoulders or add some funk to the bodice. 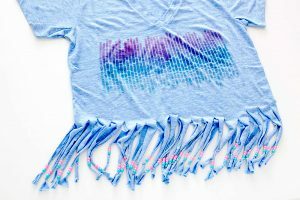 Get creative and use colors that contrast from the t-shirt color. 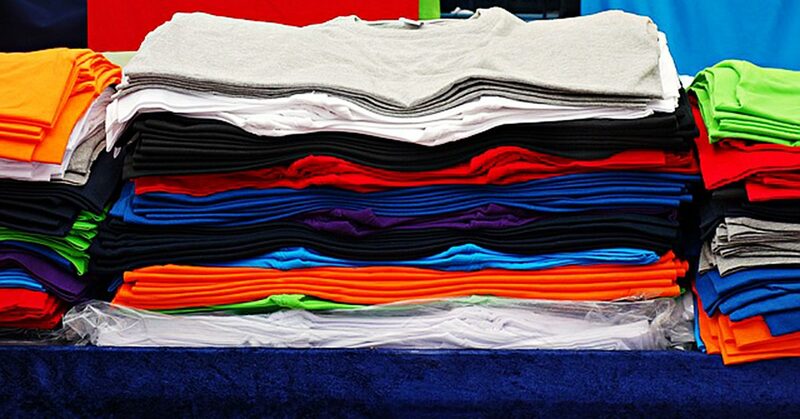 Get creative & use colors that contrast from the t-shirt color. You can do a lot with beads on your t-shirt. You can do a lot with beads on your t-shirt. They look great as a faux necklace around the neckline or along the edges of the sleeves or bottom of the shirt. Another option is to create a design on the front of back of your shirt using beads. 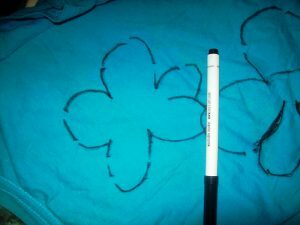 I suggest using a washable marker or pencil to draw out the design before placing the beads. Whether you use one or many of these techniques, you’ll wind up with a t-shirt that expresses your sense of style. They’re great in combination or alone. A t-shirt with even one of these creative additions would cost quite a bit in a store. Doing it yourself is both fun and cost effective. Give it a try and see what you come up with. Imagine a summer day spent by the pool with your sunscreen on, your sunglasses perched on your nose, and a cup of your favorite drink beside you. A cool breeze blows by, and you can’t help but smile from your reclined position on your seat as you casually turn the page on the book you’ve been reading for the last half hour. Then you set the book aside for the sake of refilling your drink — just when someone decides to do a cannonball into the swimming pool. The water flies upward and outward… and a huge splash lands right on your book. Suddenly, your poolside day of reading deteriorates with the knowledge that the book you were enjoying so very, very much has officially been subjected to the book-disease known as water damage. This is not a good scenario for a book fan! In fact, it can put a damper on the rest of your poolside visit! 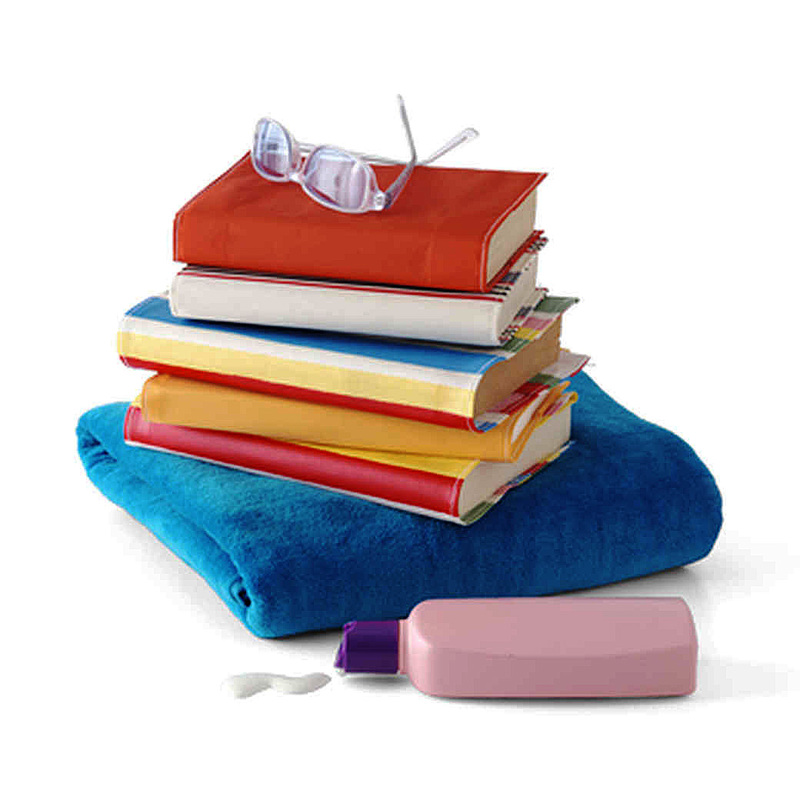 Create a waterproof book cover for relaxing day of reading by the pool. So how could this incident have been prevented? Well, you could’ve left the book at home, but there’s another possibility that would allow you that relaxing day of reading by the pool. That option is to create a waterproof book cover. You can find instructions for that concept here, but the step-by-step guide can lead to exploration if you want to properly create this book-protector. That exploration centers around one important detail, and that’s the best approach for dealing with vinyl in regard to sewing. 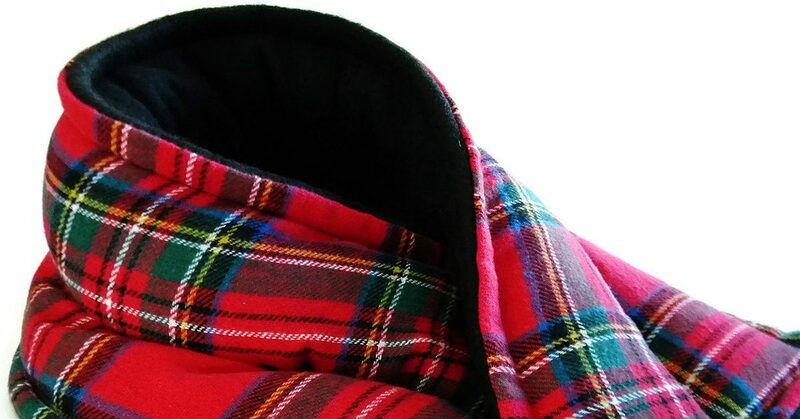 It is, after all, a much different texture and structure than more common possibilities like cotton and flannel, and if you want the best experience possible for putting together a vinyl-based book cover, looking into how it’s different and what to do about those differences can be beneficial. It’s thick. While it’s not thick enough to be something that seems ridiculous to use, it’s thick enough to come with its own concerns. For instance, you might find that the needle you used to sew that cotton project doesn’t work very well for this vinyl concept. The thicker quality calls for something stronger to easily maneuver through the vinyl to create your book cover. 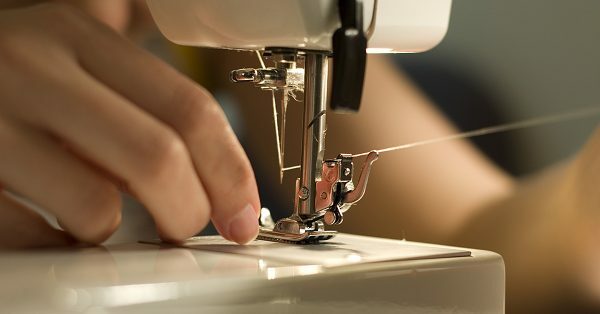 According to one source, “[i]t’s best to use a needle designed for leather or vinyl…[like] Leather Needles from Schmetz” for the task so you don’t have to wrestle with your needle as you go — or maybe even ruin your needle because it bends under the pressure. If this is your first vinyl project, you might want to look for an applicable set of needles for the job! 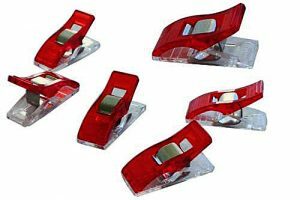 You may want to add Wonder Clips to your to-buy list for when you’re browsing through the store for your vinyl-sufficient needles. It’s not pin-cushion friendly. While the tiny holes that pin cushions can leave don’t really make much of a difference in flannel, they can make a very big difference in vinyl since they’re much more pronounced! To combat that issue, you might want to add Wonder Clips to your to-buy list for when you’re browsing through the store for your vinyl-sufficient needles. These things can keep your project on track by holding things in place without forever scarring the vinyl! “You can’t iron your vinyl flat.” If there’s something that’s a staple in preparing material for sewing, it could be to iron all of the wrinkles out beforehand. Since that strategy doesn’t really work for vinyl (it “could melt” under the iron! 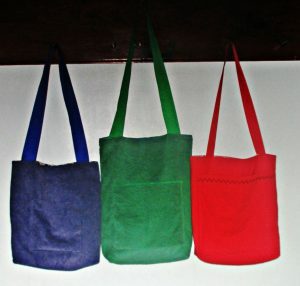 ), it leaves the question of what a person can do that make sure everything is even before that first stitch happens. 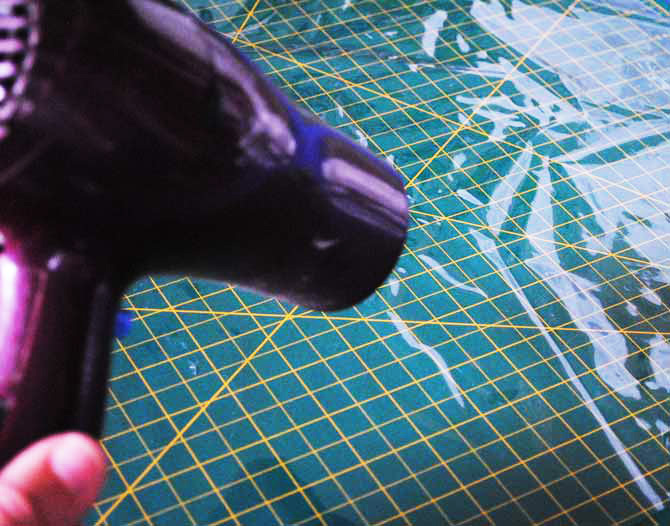 A simple solution would be to use your hairdryer on the vinyl, which will cause it to “flatten out nicely.” No bends, no damage, and no worries as you dive into making your stitches for your waterproof book cover! It might not stay in place. One of the things I personally don’t like about using a silk fabric is that it’s so easy for it to slip out of form and throw off your pinning, cutting, and sewing. And, well, vinyl doesn’t seem to want to stay in place either because of its texture. 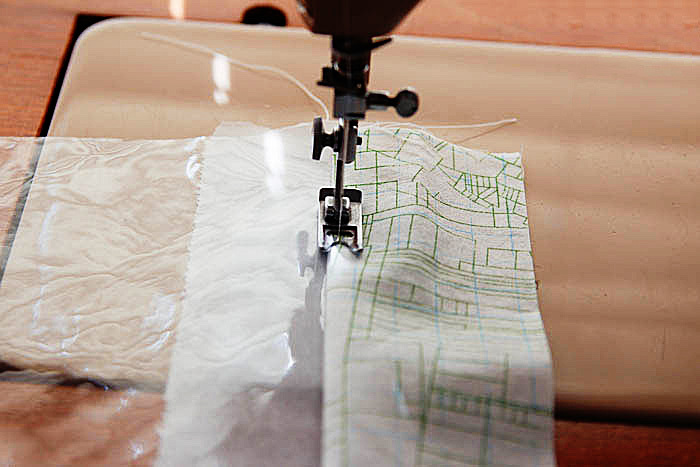 While this might make it perfect for the waterproof detail, it complicates the sewing process just a bit! This complication though is no reason to throw in the towel for this project since painter’s tape can be used to hold the vinyl in place without damaging it at all. It’s an extra purchase for the project, but it can keep things neat and orderly as you go to create a better, easier-made product. Use tissue paper to preventing sticking. It might stick to your sewing machine. To my thinking, few things are more frustrating in the world of sewing than having material that won’t feed through your machine correctly, and since vinyl can stick, this could be a headache waiting to happen! It doesn’t have to ruin the experience though! 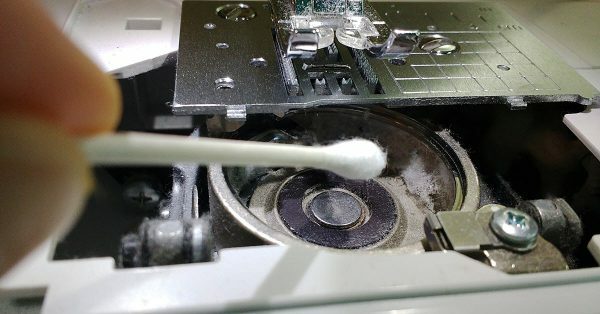 You could use tissue paper on “the side [of the machine] that is having trouble” while you feed the vinyl through to keep it from touching that part of the machine, thus preventing the sticking. Once you’re finished, this tissue paper “will easily tear off” to become but a memory of a sewing hack you employed! 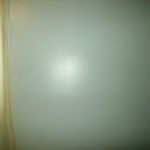 If you use these tips, tricks, and suggestions, you might find using vinyl is not so difficult that you have to remove it from your list of materials to use. And if you can use it, don’t hesitate in protecting that new paperback from the swimming pool splashes with its own book cover! It’s one step closer to that wonderful possibility of a summer vacation, poolside read! 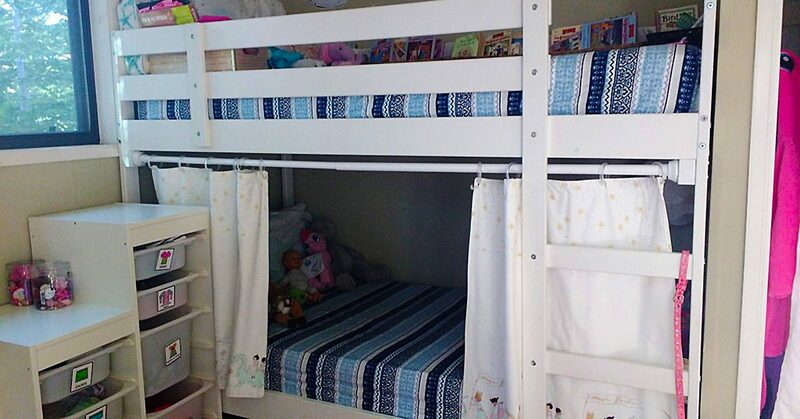 My daughters have bunk beds and I like them to have at least two sets of sheets (per bed) in the event of accidents, sickness, or just in general because kids get dirty. Our family doesn’t use flat sheets. I always feel claustrophobic when I sleep with one and I end up pulling the sheet out of the bottom of the bed and using it more like a blanket. 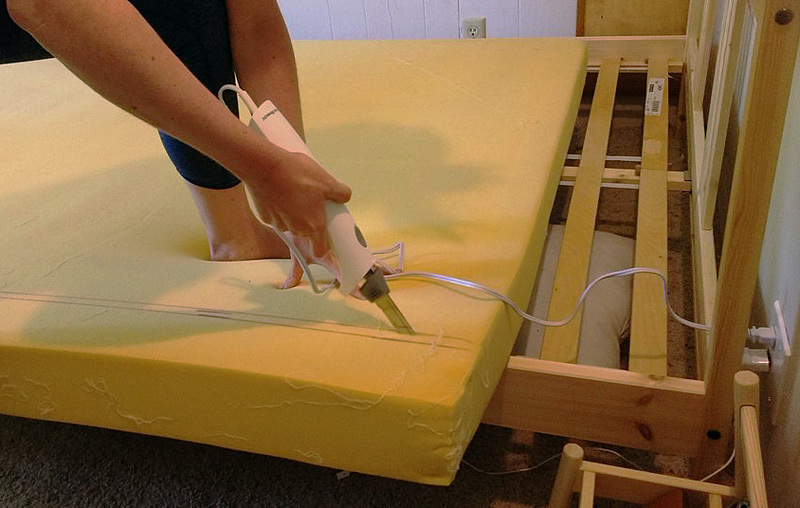 It’s also a pain to remake the bed every morning. 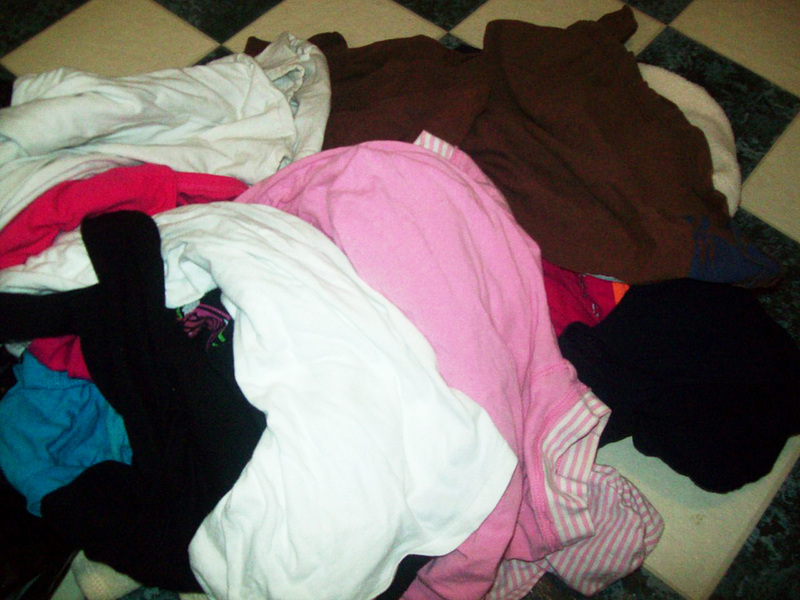 Instead, we used fitted sheets and loose blankets and we wash them all frequently. Because of this, I can buy one set of sheets, a fitted one and a flat one, and turn the flat sheet into another fitted sheet. 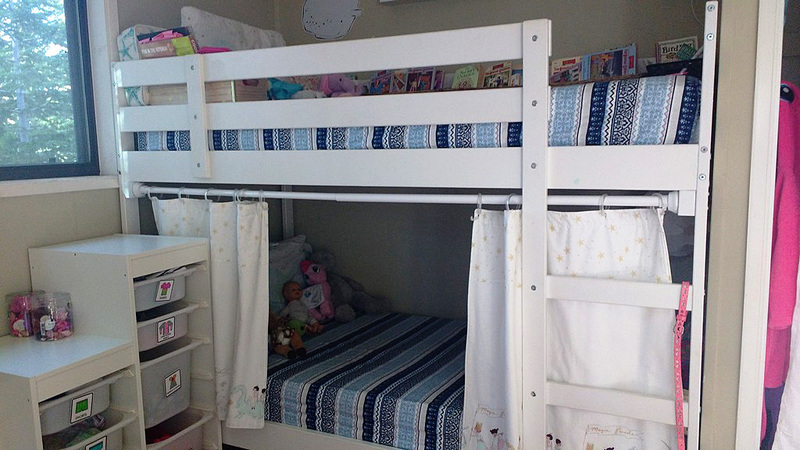 That gives me two matching fitted sheets which is perfect for when you have bunk beds. To make your own fitted sheet you need to measure the length and the wide of the top of the mattress you are using. 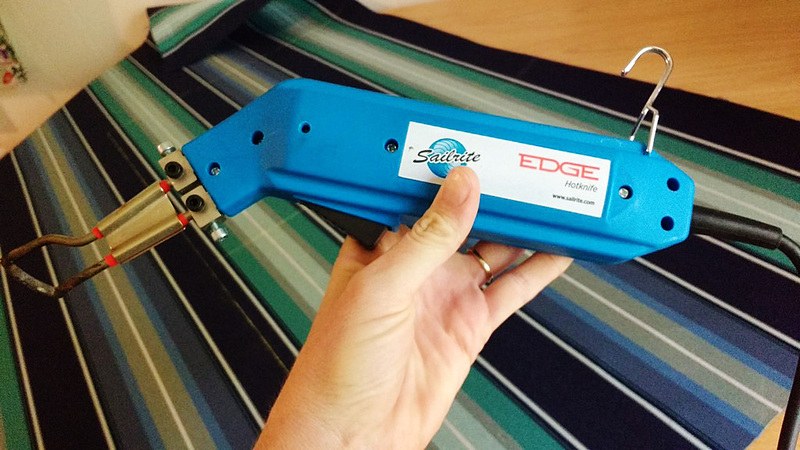 You’ll also need to measure the sides. 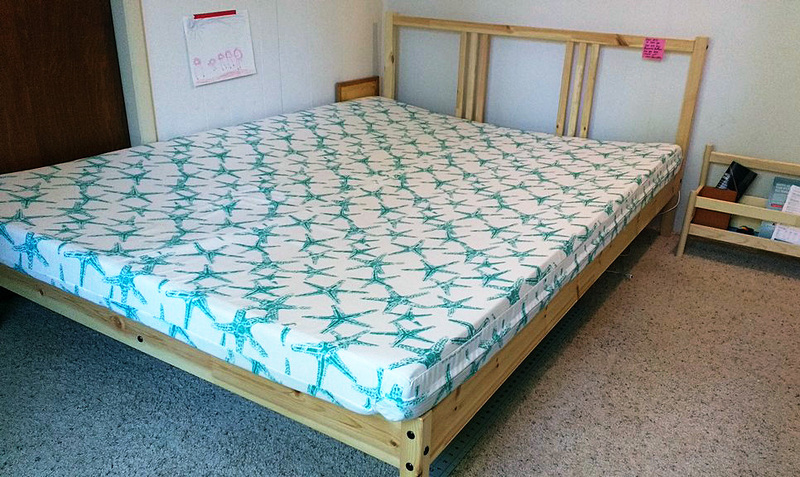 This mattress is 38” x 75” and the sides are 7”. To make your own fitted sheet, first measure the sides, length & width of the top of the mattress you are using. 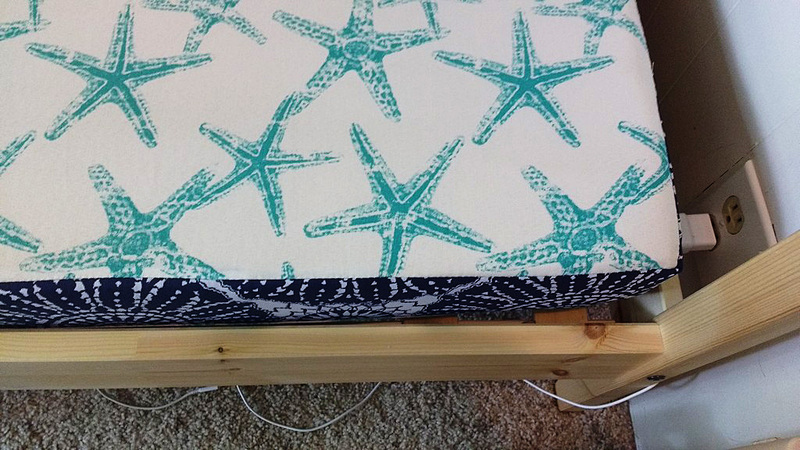 To determine the rest, you need to add enough fabric to wrap around under the mattress plus seam allowance. 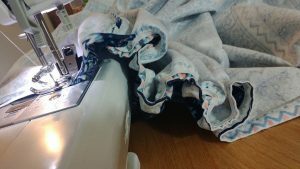 I like anywhere between 3-4” for the bottom fabric (it may depend on the size of flat sheet you are working with) and I allow 1” on all sides for seam allowance. 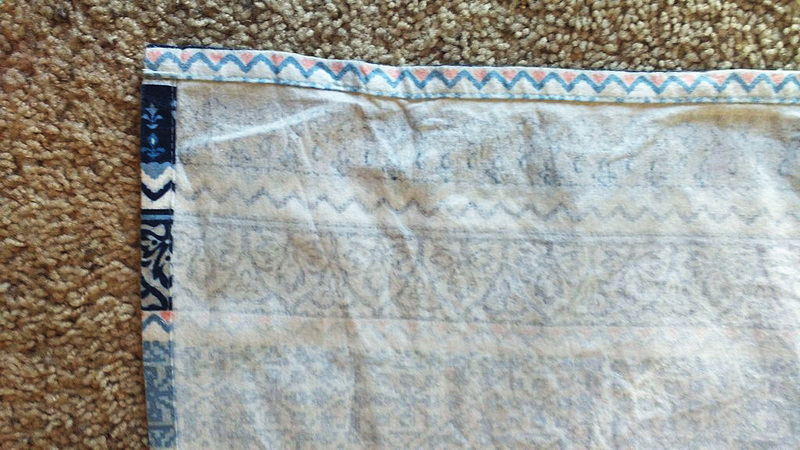 I fold the fabric over ½” and then again another ½”. 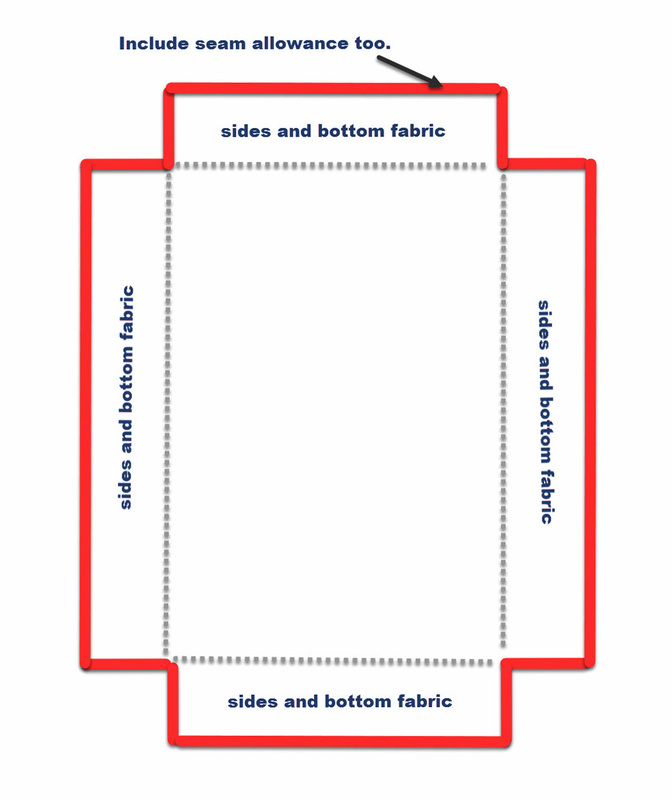 Seam allowance + bottom fabric + length of side + width (or length) of top of mattress + length of other side + bottom fabric on other side + seam allowance on other side. Repeat the same process for the length if you started with the width. I had to take out the top folded seam in order to have a large enough rectangle to meet my measurement requirements. 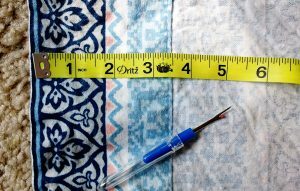 For this flat sheet, I had to take out the top folded seam in order to have a large enough rectangle to meet my measurement requirements. After I took out that seam, I ironed (after having prewashed before I got started). I had to take out the top folded seam in order to have a large enough rectangle. Sometimes I love how the universe works. The particular measurements on this flat sheet made it so I didn’t need to calculate seam allowance, other than for the one side I had to take the seam out of. I used all the pre-sewn hems and the measurements worked out perfectly. I used all the pre-sewn hems & the measurements worked out perfectly. The one part that people might find tricky is cutting out the corners. 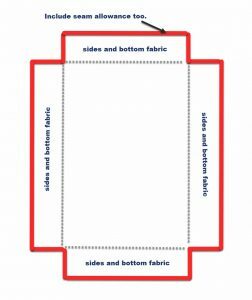 Here you are going the exact measurement of where the fabric would rest on the top of the mattress, so you take into account: seam allowance + fabric on the bottom + fabric on the sides, on each corner of the square. 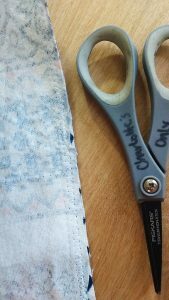 Make the squares on all corners of your fabric and then cut. 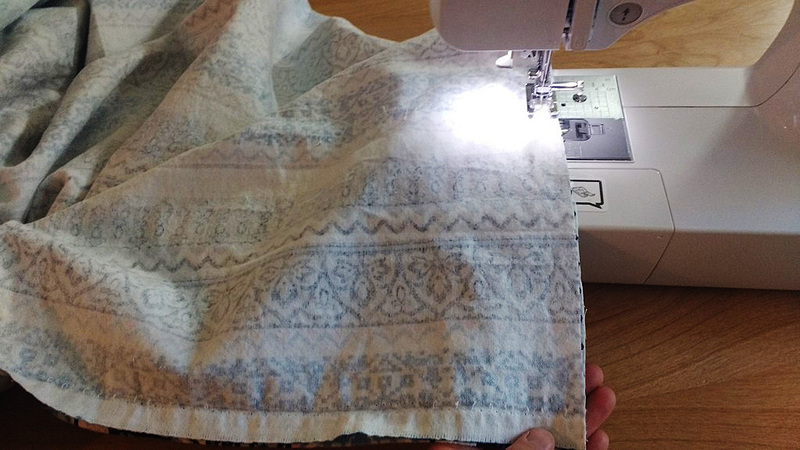 Make the squares on all corners of your fabric & then cut. 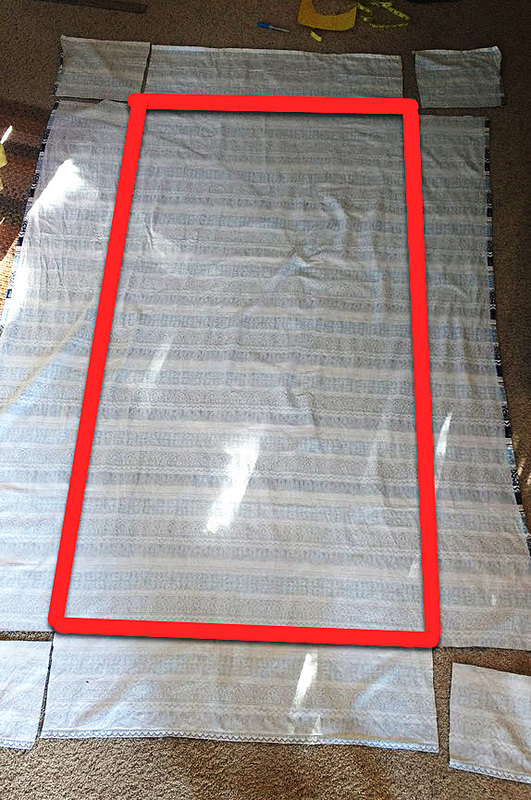 The red box shows you the exact measurements of the top of the mattress. 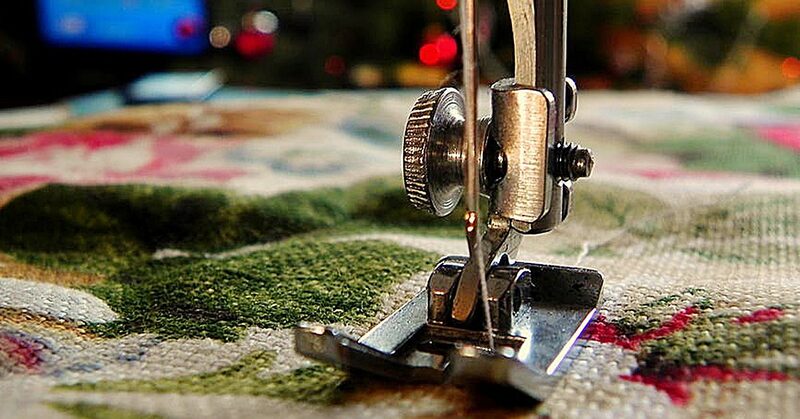 On your mark.. Get set.. SEW! Now it’s time to sew! If it’s easier for you to pin the corners, go for it. 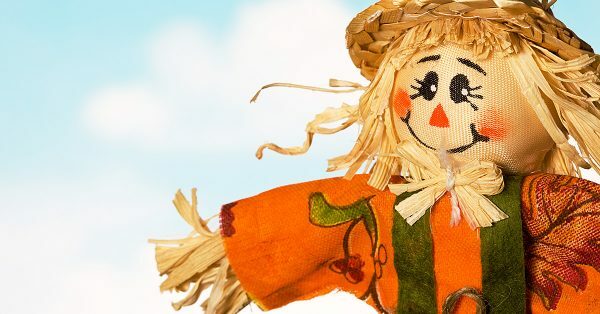 This isn’t my first rodeo, so I just sew and go. If it’s easier for you, just pin the corners. These corner seams ARE unfinished, so make sure you finish each of the four corners with a zigzag stitch to prevent unraveling. 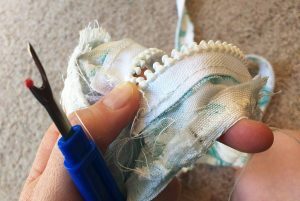 Finish each corner with a zigzag stitch to prevent unraveling. 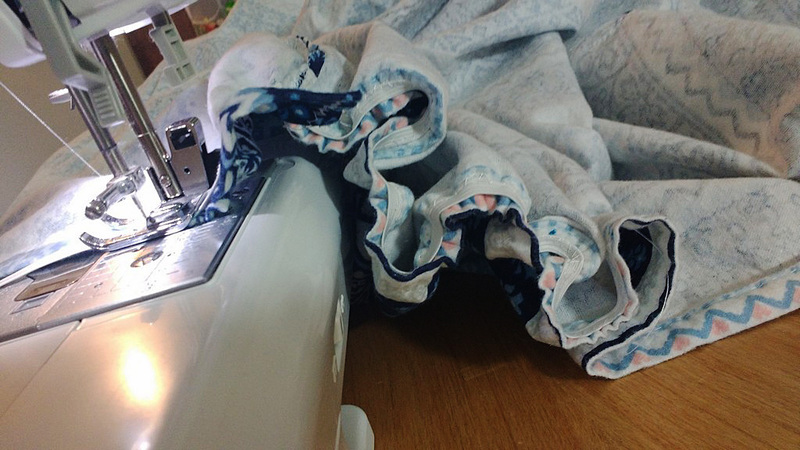 The next step would be to create a hem all along the sheet. I’m skipping this part because I’m using the pre-sewn ones from the flat sheet. Normally I would finger fold the fabric over a ½”, and then another ½”, and sew all around the sheet. 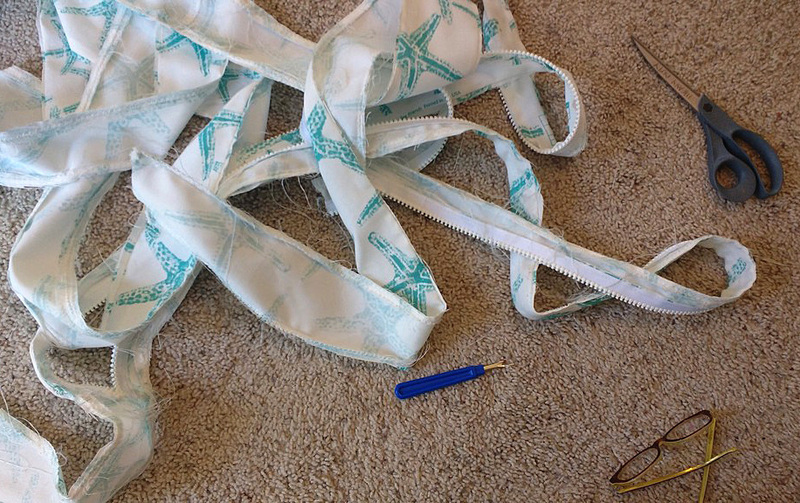 After you have a hem, it’s time to add elastic. 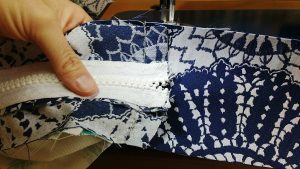 Some tutorials have you create a casing when you sew the hem and then you feed the elastic through. This method has never spoken to me. 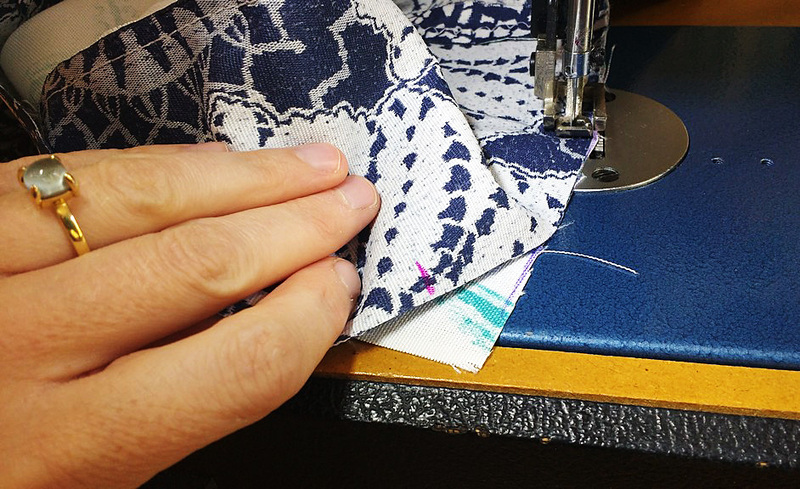 I just sew my hem and then sew the elastic directly on. If I had enough elastic I would sew it on the entire hem, all the way around. I didn’t in this case so I measured out 16” from each corner and sewed my elastic around each corner. I measured out 16” from each corner & sewed elastic around each. Be careful not to pull your elastic too taught. 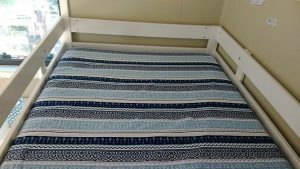 You want it to have enough give that you can get it over the corners of your mattress without snapping any of your threads. Be careful not to pull your elastic too taught. Moment of truth. Here it is on the top bunk. It looks great! Here it is on the top bunk. 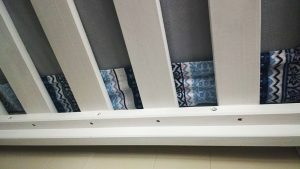 It even looks good from the bottom bunk looking up at the bottom of the mattress. It even looks good from the bottom bunk looking up. 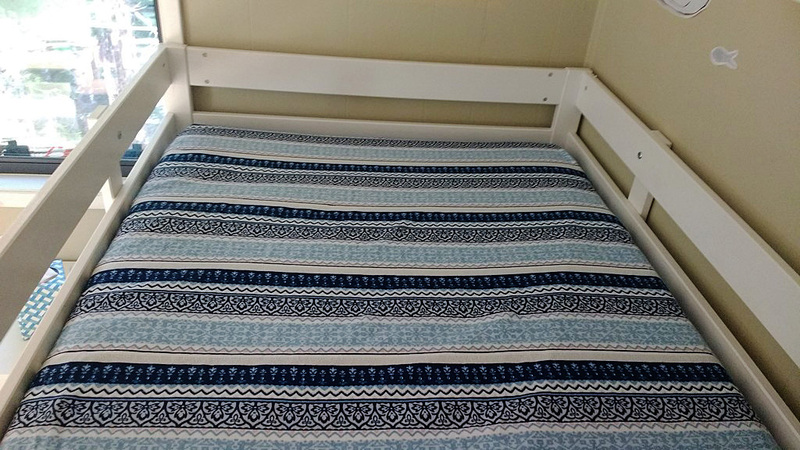 The best part is that these two fitted sheets are now interchangeable between the bottom and top bunk and I only had to buy one set of sheets to get matching bedding! The best part is that these two fitted sheets are now interchangeable. Do you make your own fitted sheets? What is your favorite method? Much like the aforementioned buttons on a previous Pete the Cat related post, trends can show up for a while and eventually become memories. 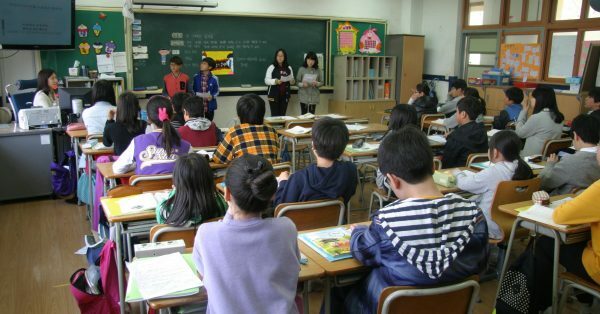 As they’re in the mainstream of their field though, it can be fun to jump on board and partake in them! These trends can bring brand new concepts, images, and characters to life, or they can just offer a new twist on something that’s familiar and ordinary. 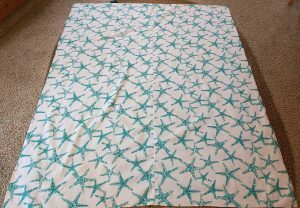 Those familiar and ordinary details are the case for the trend that will be explored in this post: Beach Towel Sewing Projects. When I first saw that this was actually a thing, I was perhaps a little interested, but maybe just as uncertain. I’m not even sure what would lead to this trend beyond a creative eye that’s often looking for new possibilities. Whatever the reason for the trend’s existence, you can find a number of projects that are beach-towel based through some online browsing time or the links given in this post. 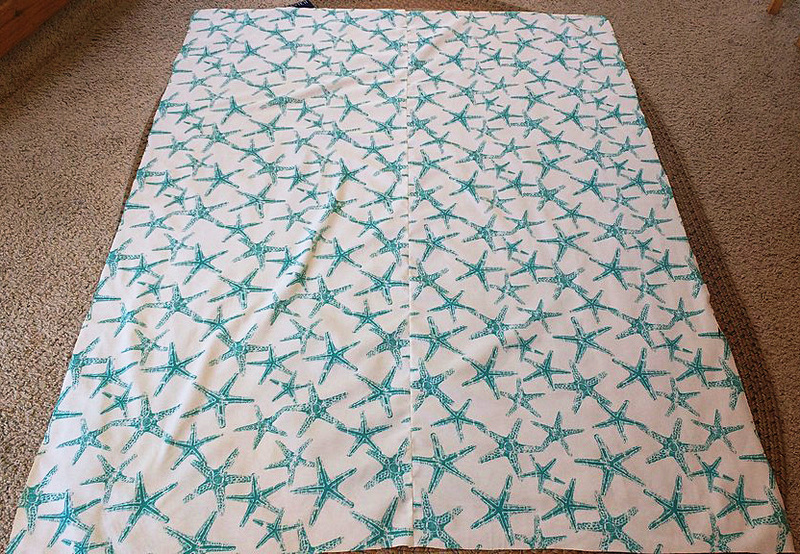 I think this beach towel concept is such a unique option for sewing projects, and I guess that’s for two reasons. 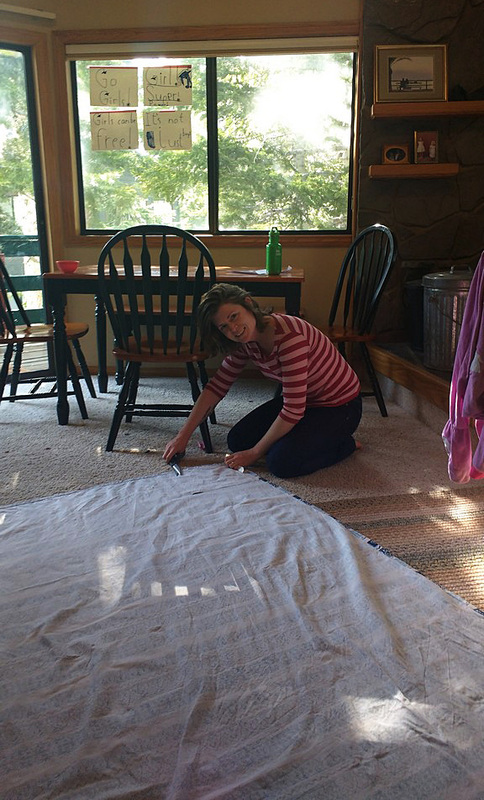 One, using extra beach towels for projects could be a wonderful way to get your creative mind going while clearing out your closet space. Two, the end results to these possible products are so fluffy that they draw my attention like a child going after a stuffed animal! Maybe you share that appreciation, and maybe you don’t! 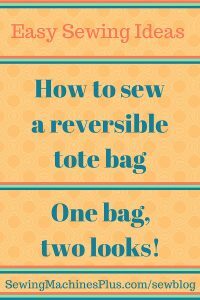 Still, these are good options for how to put no-longer-used (or brand new) towels to use for your sewing hobbies! This quirky accessory could stand out on your next beach adventure. 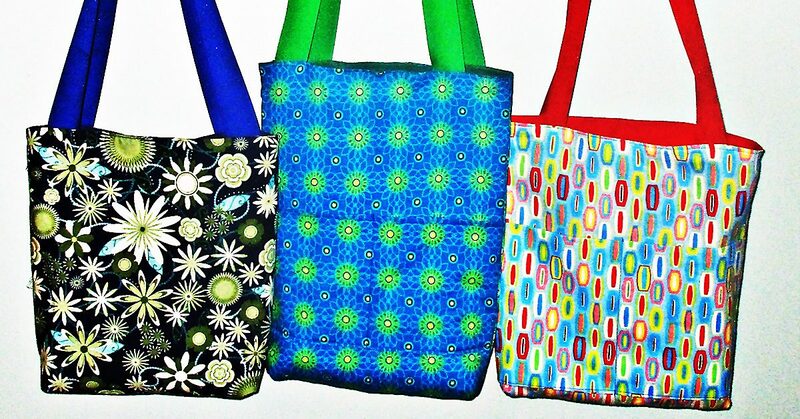 First on the list, how about a beach towel tote? 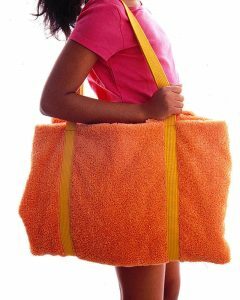 This quirky accessory could stand out on your next beach adventure, and it would be large enough to hold your sunscreen, your Frisbee, your sunglasses, and whatever else you could fit into this decently-sized bag! 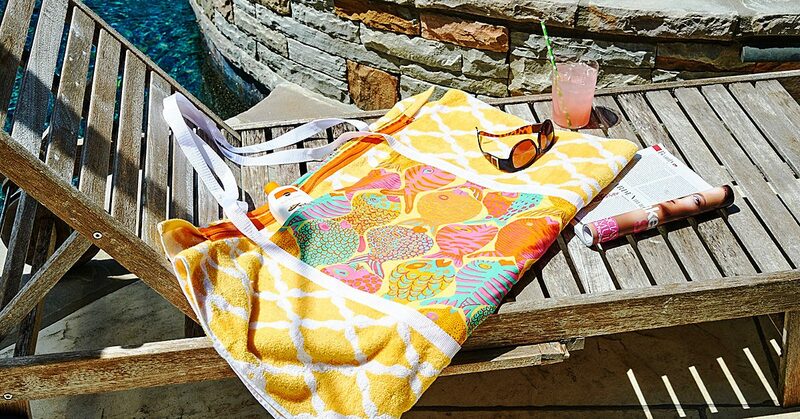 You can use something plain-colored like what’s shown in the image, or you can choose a more dynamic print on the beach towel to increase its stand-out quality! 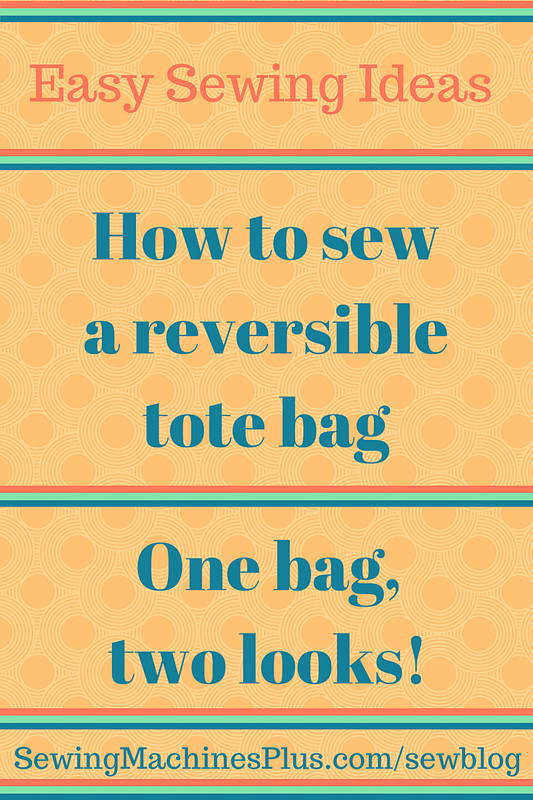 The needed supplies are few, and the unique look of it could be worth your sewing time! Why not give it a try? While they lack the larger size of a tote, these can still be spaces to hold some of your beach bring-alongs. 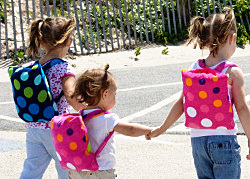 But, then, maybe you’re more of a backpack person? If so, no worries! 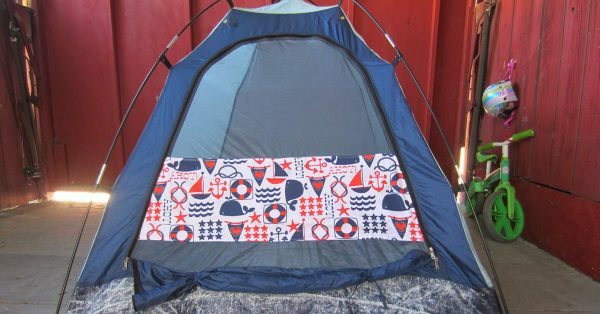 You can make one of those using a beach towel as well! 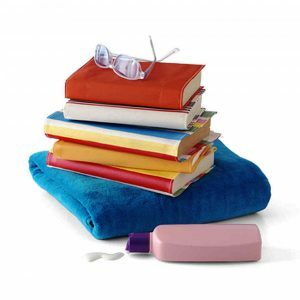 While they lack the larger size of the tote, these can still be spaces to hold some of your beach bring-alongs, like sunscreen and a book to read in the sun. And, obviously, the use of these products wouldn’t need to be limited to the beach. Anywhere that you might think to bring a purse, these could be options if it’s a setting you’re comfortable using it in. Considering the site says this project can be finished in less than 24 hours, it might be worth your time to give it a shot! I personally like this elephant idea. 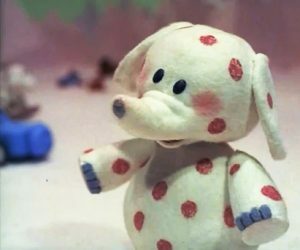 I never got over the toy elephant from Rudolph. Adorable! If you’re looking for an option that deals a bit less with the carry-stuff-along-with-me aspect, there are possibilities to explore in other categories as well—like stuffed animals! These toys are a wonderful fit for this beach towel option because of that fluffy quality I mentioned earlier. If you’re going to make a stuffed animal toy—maybe a dog—it makes sense that the dog has fur, right? I personally like this elephant idea, but it’s very possible that I never got over the spotted elephant on Rudolph! If you prefer a different animal to make into a toy, browse through your options and find the right colored beach towel to match the standard coloring of that animal—unless you really do want a spotted elephant or something as out of the ordinary! An intriguing option for creative towels use. There’s also the option of creating something from a beach towel for the sake of gift-giving, if towels are a part of a gift you have planned for someone. 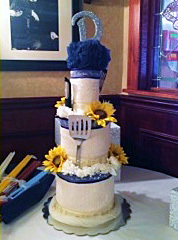 One such option that stuck out to me was a bridal shower cake. 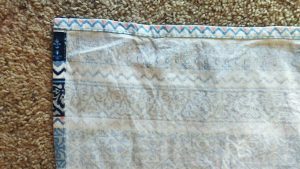 True, this might require something less bulky than a beach towel and wouldn’t necessarily help to clean out your closet, but it’s still an intriguing option for using towels in general for creative endeavors. 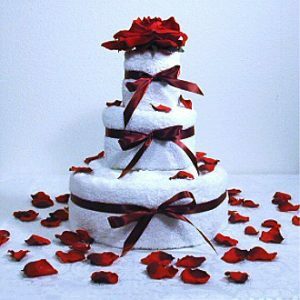 This cake is a method of giving very typical housewarming gifts, like towels and other items, in a lovely and out-of-the-box manner. It’s unique and striking, and a way to show the gift recipient that you cared enough to craft something artistic with your gift just for the sake of presentation. A towel cake, after all, is more memorable than some towels and utensils waiting in a box or a gift bag! This cake is a unique twist on giving very typical housewarming gifts. 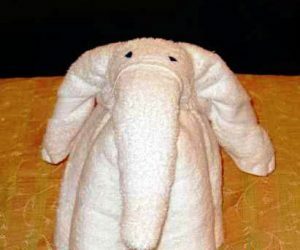 For a beach trip, a random toy, or a bridal shower, there are interesting projects that can make use of towels! These are just a handful of them, but maybe they’ll get the ideas rolling in your head enough to spark your interest! 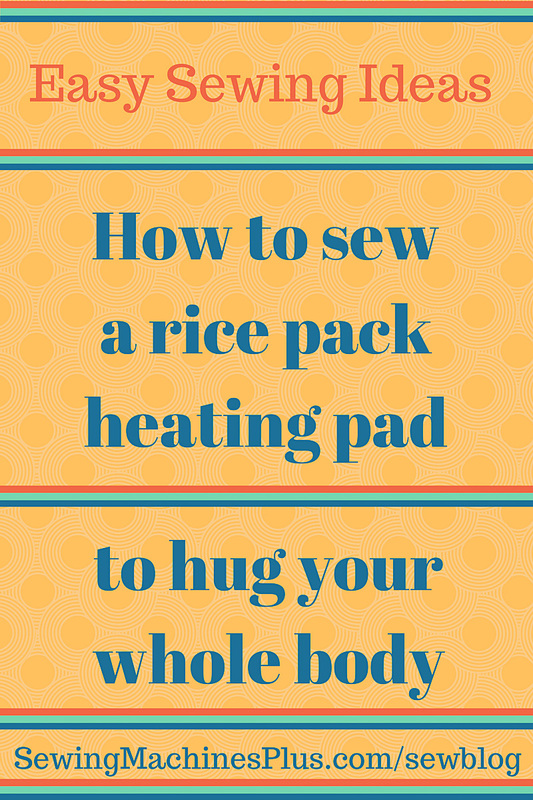 You can sew a rice pack heating pad to any size at all. The first one I ever made was a rectangle maybe about four by six inches. Okay, maybe it was a little bigger than that, but in use, it turned out to be silly small and I wanted a larger one. I have made smaller rice packs that serve a neat purpose, though. These make sweet pocket warmers when stuffed with rice. 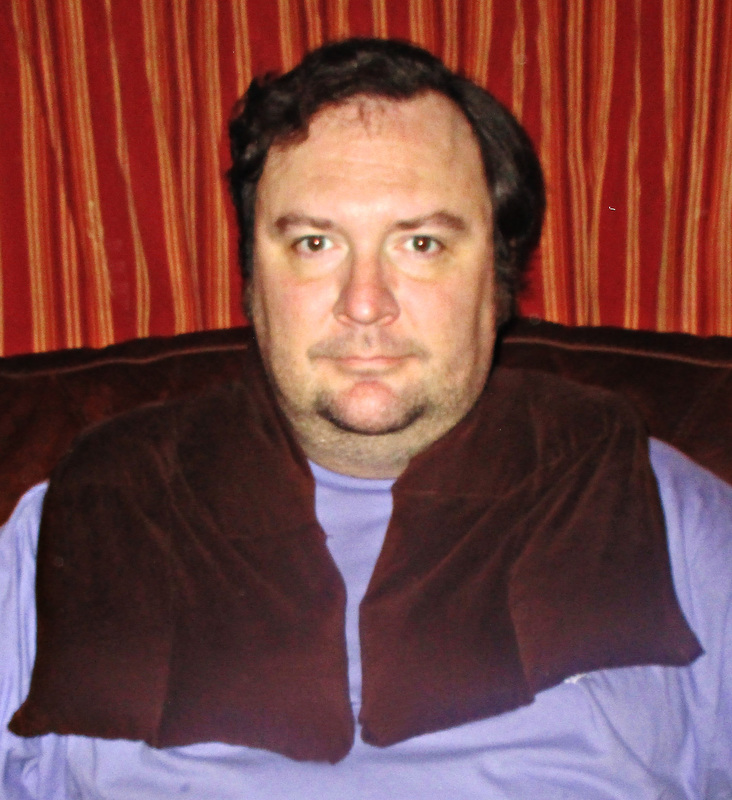 For a heating pad, bigger is better. So I made a large one with a folded kitchen towel and a big bag of rice, and this was a helpful friend for some time. 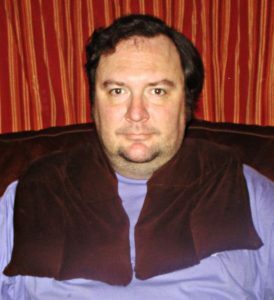 But have you ever wanted a full body hugging heating pad? I have, every month for some time now. I have wanted one to wrap around my tummy, and my dear and I have both wished for something bigger for pains in the neck and shoulders, too. So I bought a huge bag of rice in bulk and decided to finally sew a rice pack heating pad big enough to wrap around. 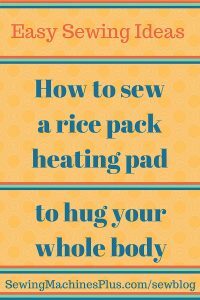 So I bought a huge bag of rice in bulk & decided to finally sew a rice pack heating pad big enough to wrap around. Of course you need a sewing machine, thread, scissors and/or a rotary cutter and mat. Fold the fabric for your heating pad in half so that it makes a long rectangle approximately 44 inches (it will likely be shorter than 44 inches after pre-washing your fabric) by 12 inches, and press. Then, make a narrow hem along both of the long (~44”) edges. 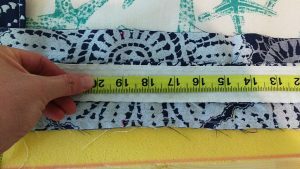 Or you can serge along these edges with your serger. Now fold it again, with right sides together. Sew along both short edges. Leave the long end open. Of course you can serge these seams, too. Clip the corners, and turn right sides out. Now you are going to measure and then sew four lines of stitching to section the rectangle into five sections. These lines will run parallel to the end seams you just sewed. I found the middle, then measured four inches out from there on either side, and marked my first two lines to create the middle section. Then I measured eight inches out from each of these to create the other sections. Sew these lines from the bottom but end them approximately 3/4 inch before you reach the top. 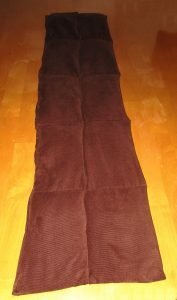 And there is your whole body heating pad, which will wrap all around like a warm & heavy hug when you need it. Scoop two cups of rice into each opening. Hold the bag and be sure all the rice flows to the very bottom of the pockets. 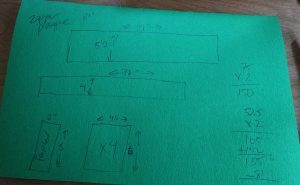 Now, sew a long line, parallel to the open edges, to bisect the five sections into ten. Scoop two more cups of rice into each of the remaining five sections. 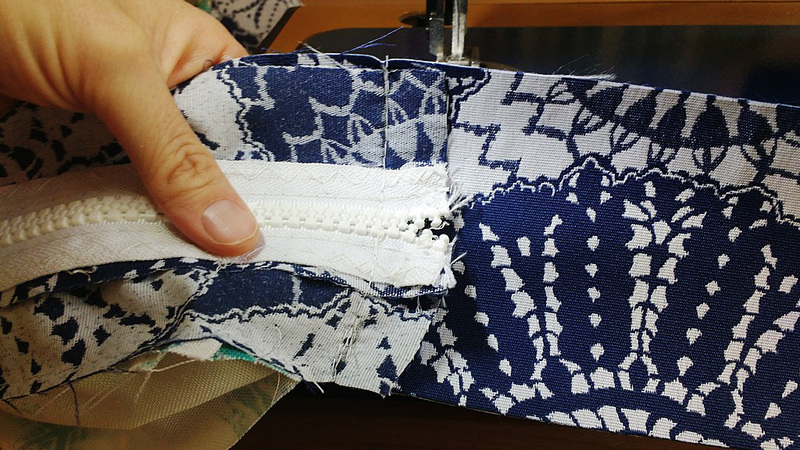 Then you can sew the long opening closed. I turned this over and sewed it down again to make this seam stronger, too. If you want to be extra careful to prevent the rice from spilling out while you sew, then take the extra time to baste the long opening closed with quilter’s safety pins. And there is your whole body heating pad, which will wrap all around like a warm and heavy hug when you need it. Microwave the heat pad to warm. Microwave ovens vary a lot, so you will have to determine for yourself how long you should heat yours. Five minutes seems about right for mine, but be careful not to burn yourself. Remove the pad from the microwave, shake it up a bit and evenly distribute the heat. Wrap it around your tummy, your shoulders, even your legs. Or lie down and use the whole length along your back from top to bottom. And feel better soon!